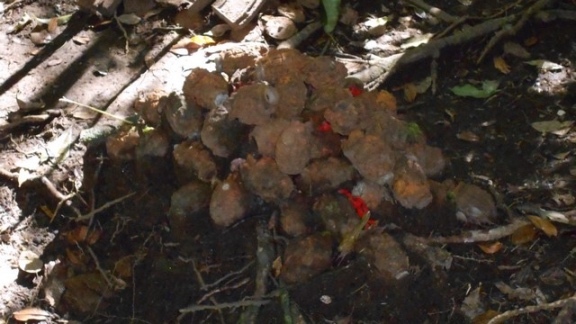 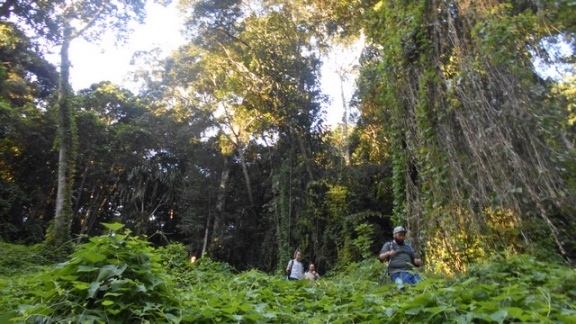 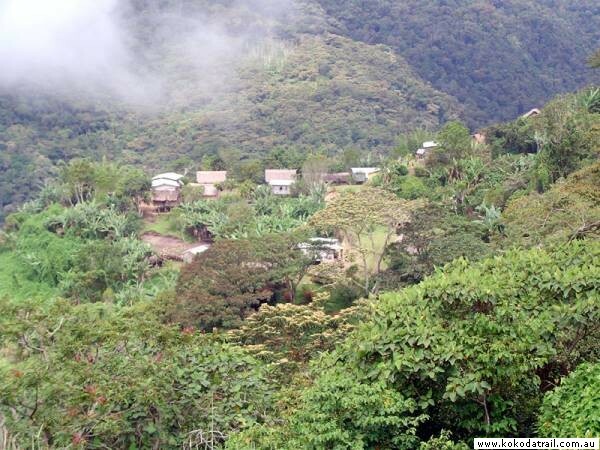 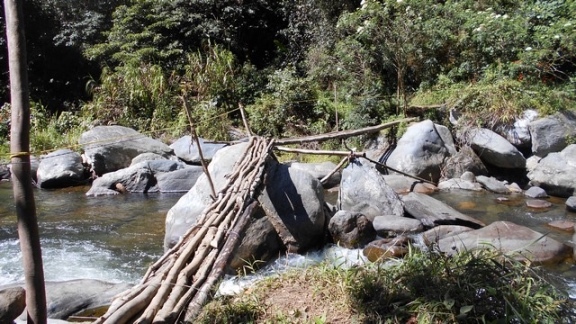 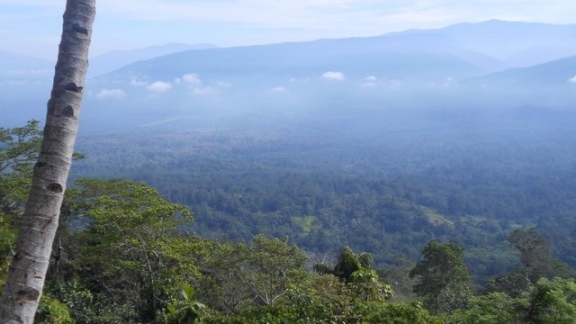 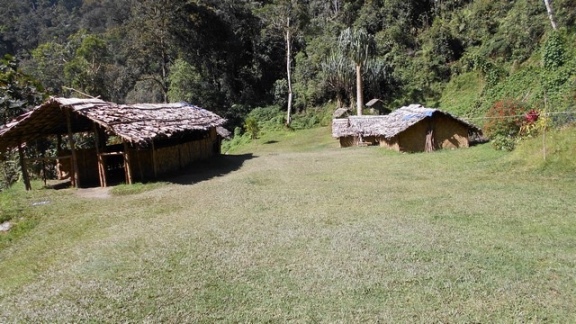 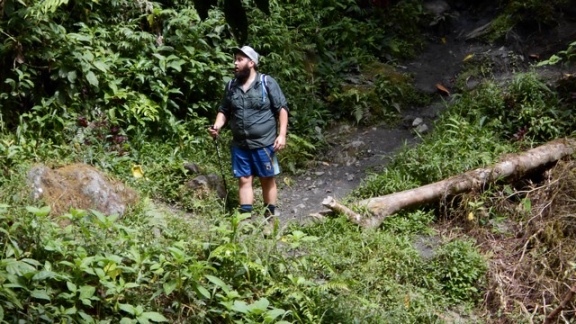 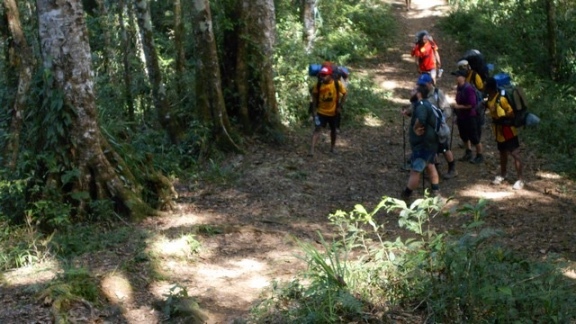 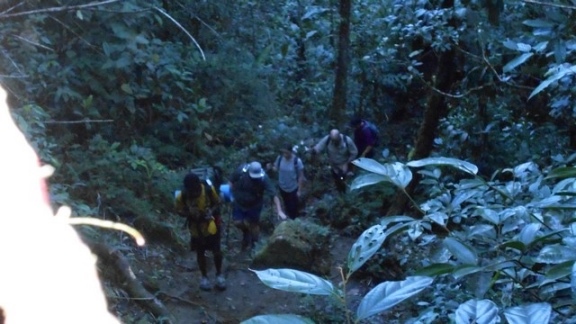 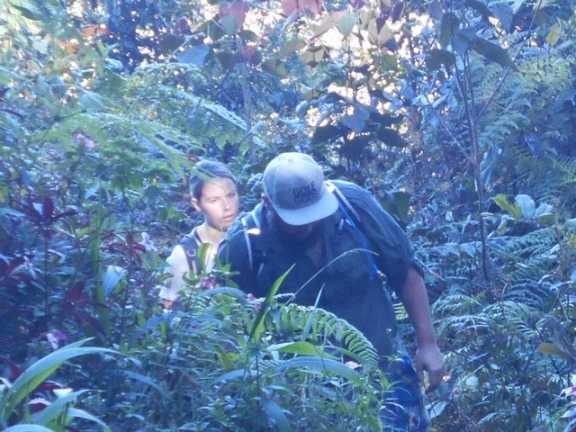 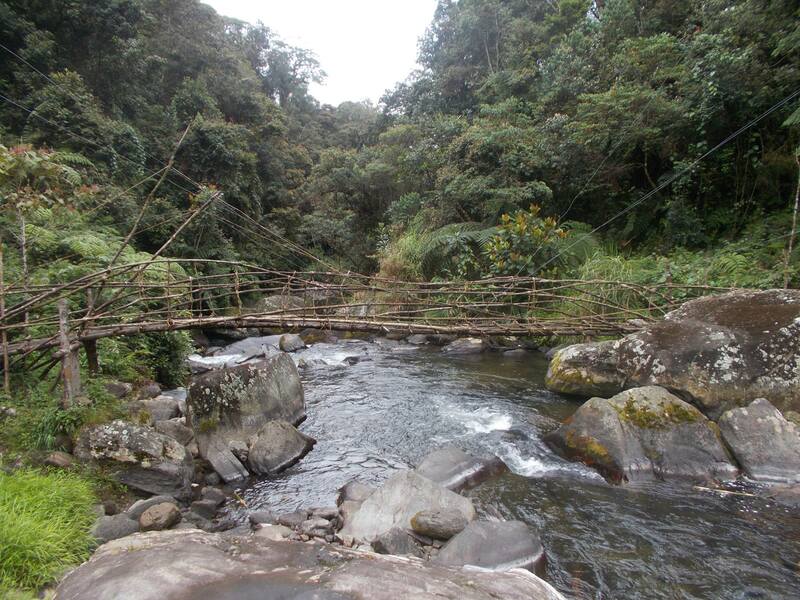 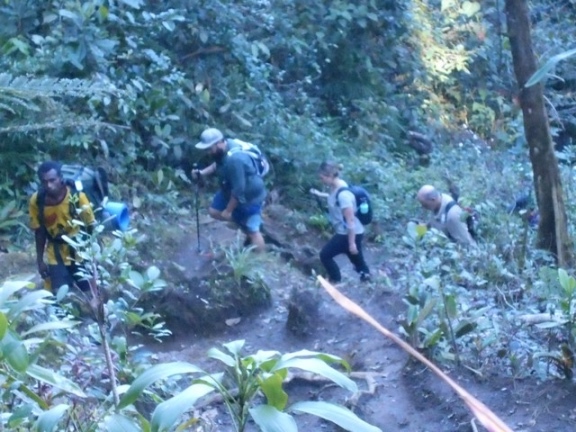 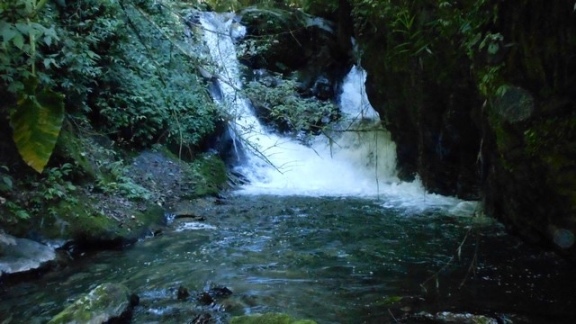 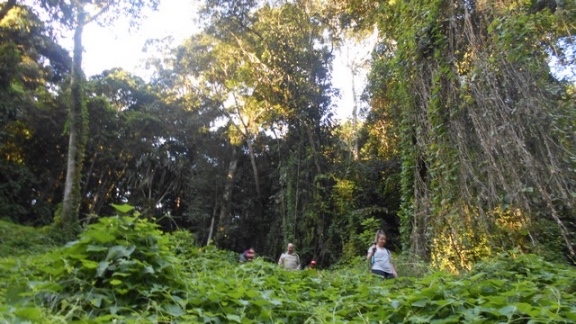 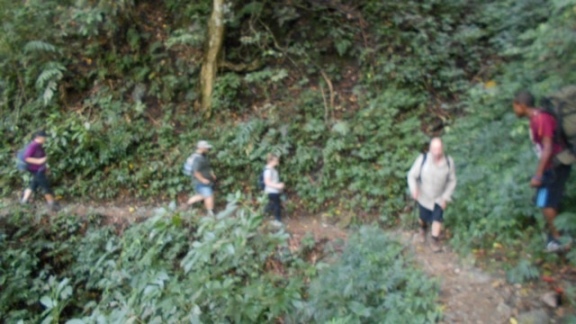 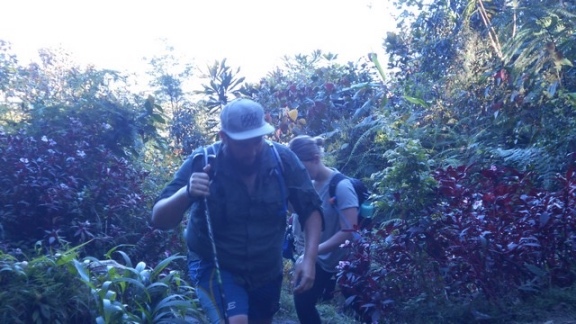 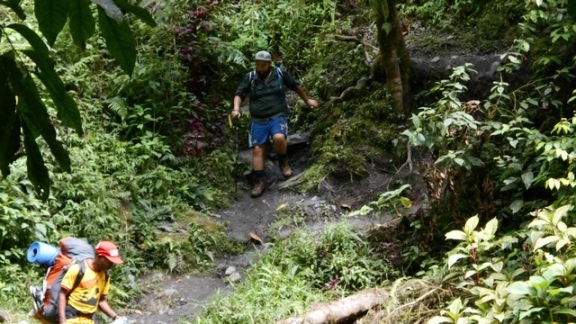 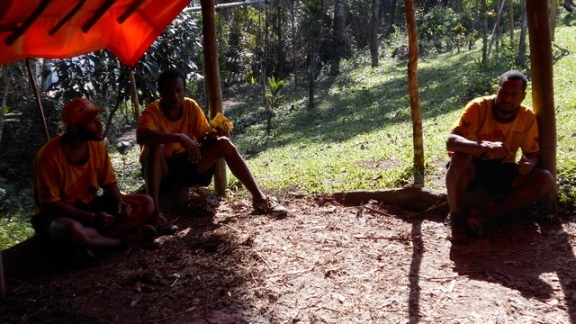 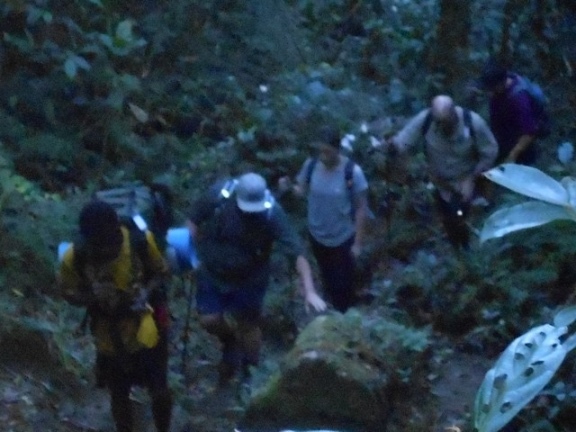 Trek 1123: This trek has now reached Ua’Ule Creek where they have stopped for the night. 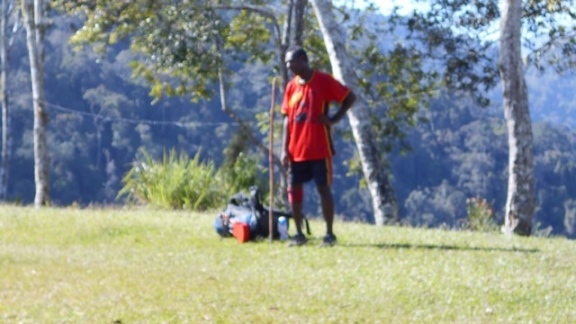 Harold said they all did well today and looking forward to tomorrow when they head to Nauro. 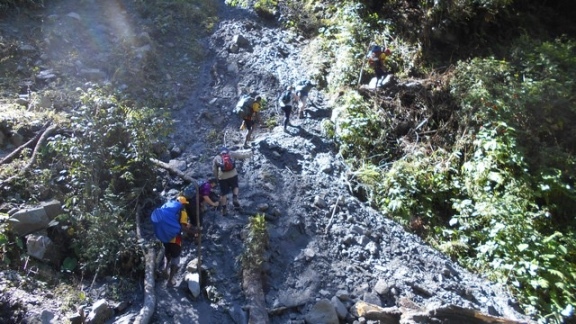 Still lots of trekkers from all different trekking companies on the track. 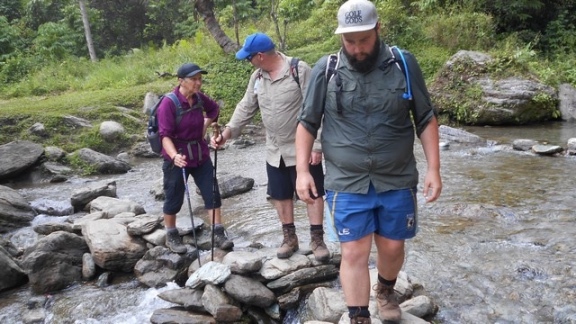 For anyone following this trek, please bear in mind that the photographs posted are from our stock file and their own will be posted when the camera carried on the trek is returned to our base on the 25th July. 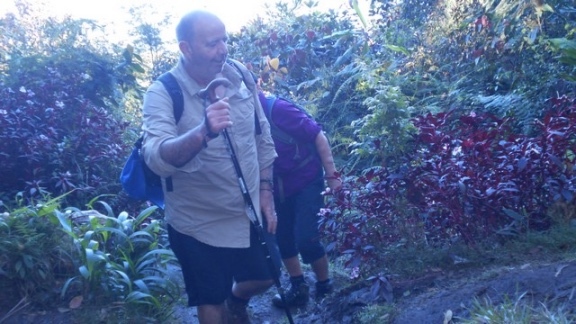 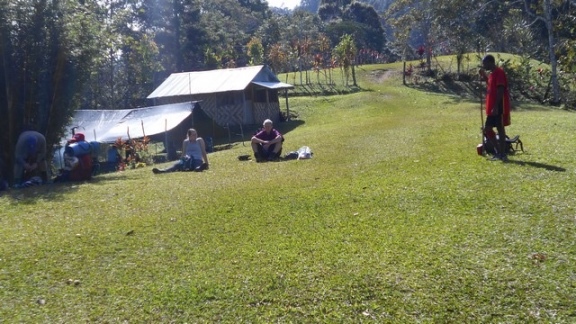 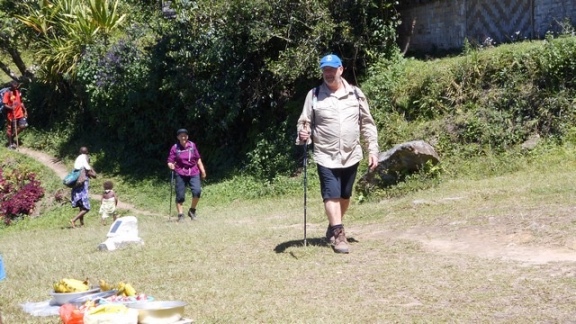 This trek led by Harold Hauro went to Bomana War Cemetery yesterday. 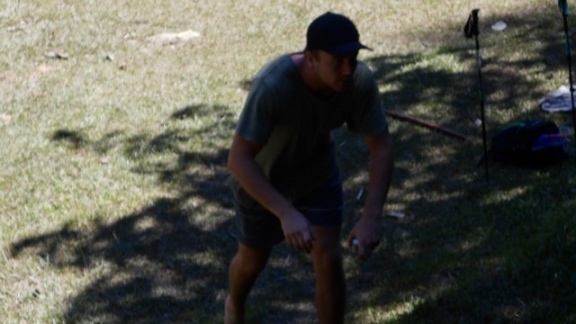 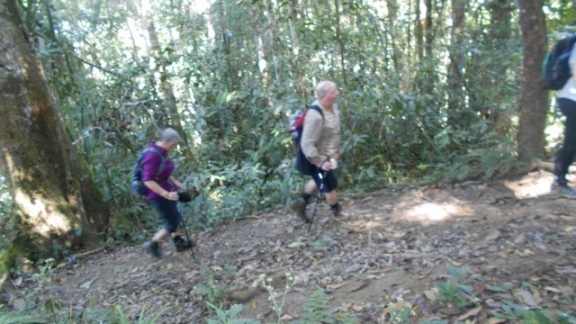 This morning around 8am saw them heading down to Goldie River and onto the track. 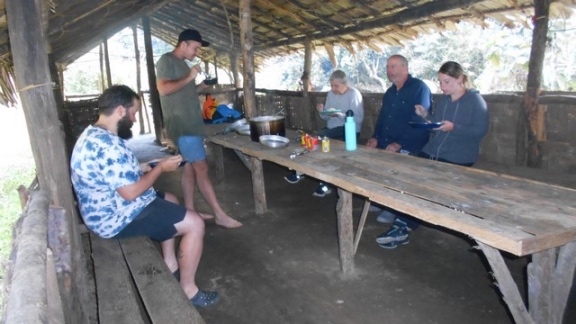 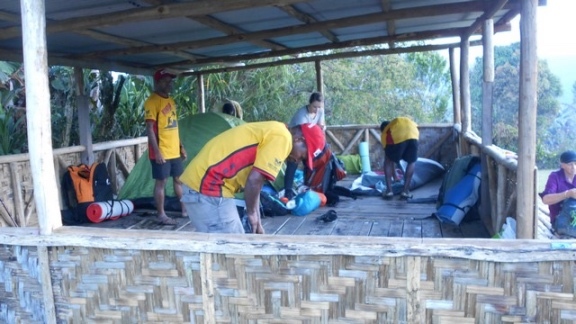 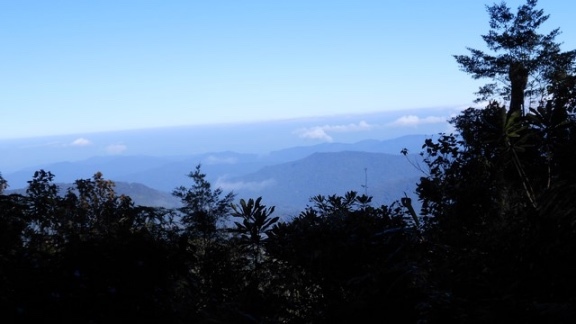 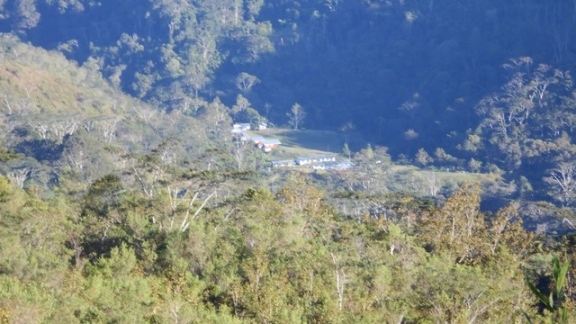 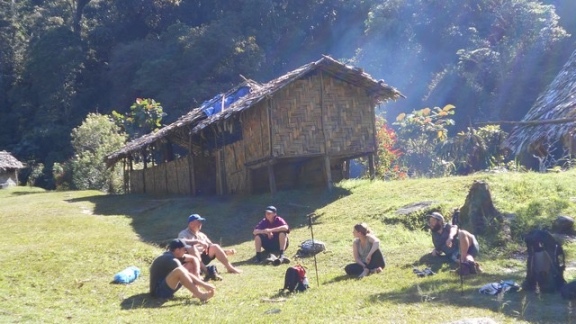 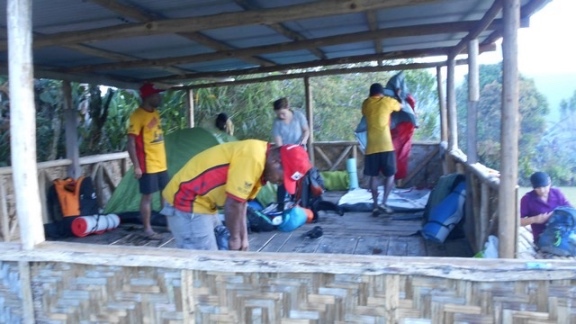 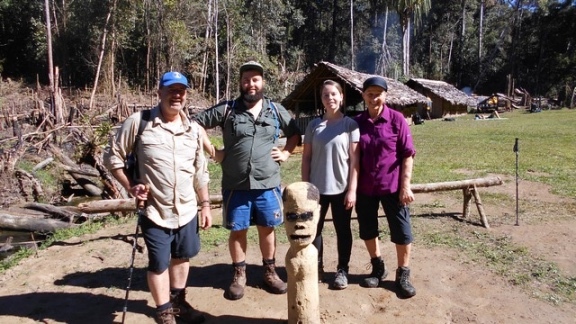 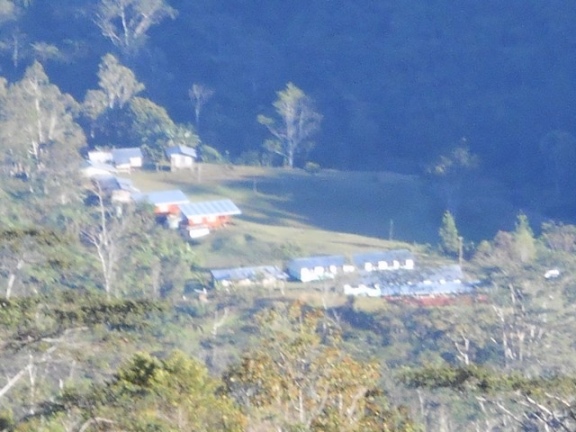 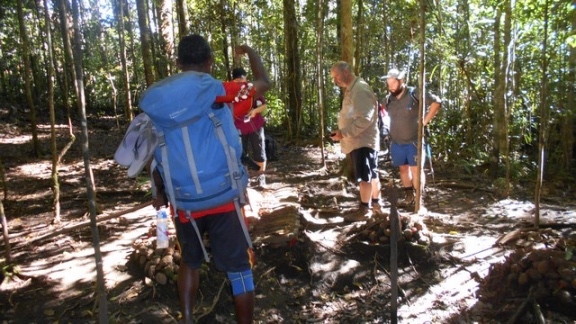 Trek 1123: This trek is now at Nauro Village along with our sub-contract trek, so a big team of our Kokoda Trekking porters camped there tonight with their various trekkers. 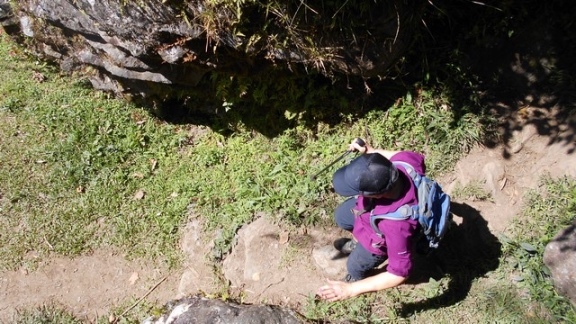 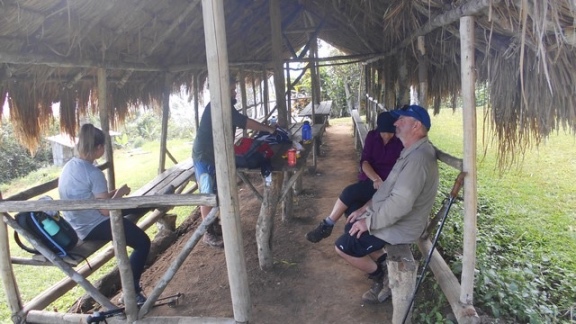 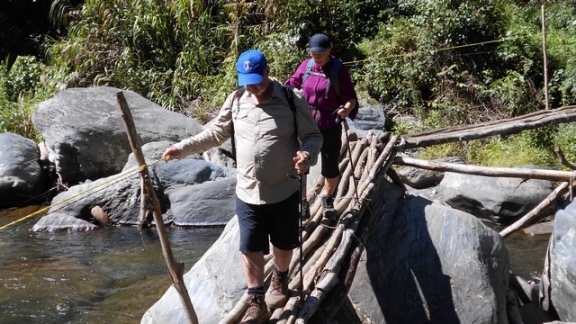 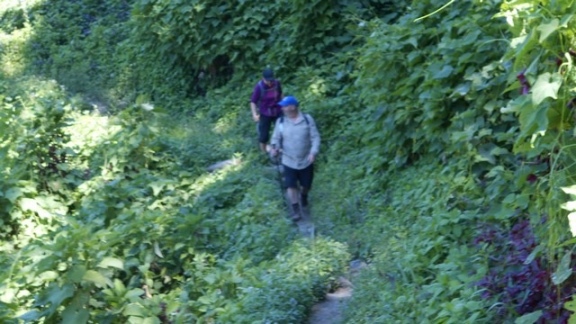 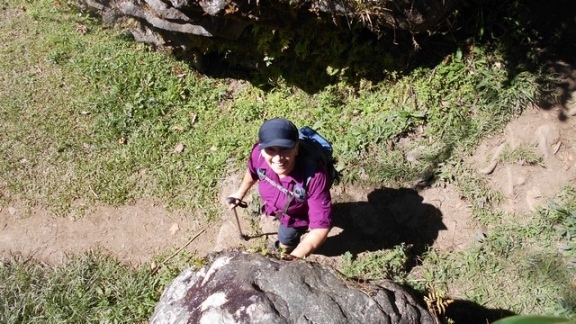 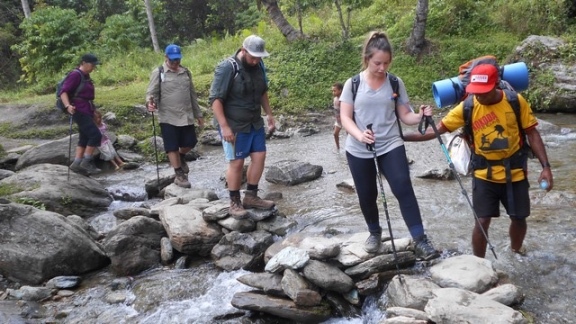 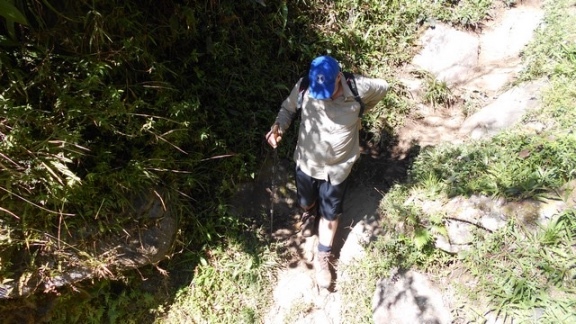 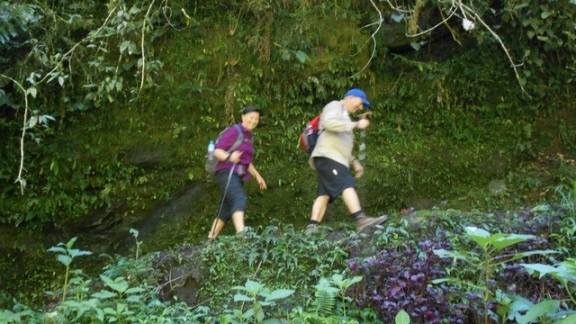 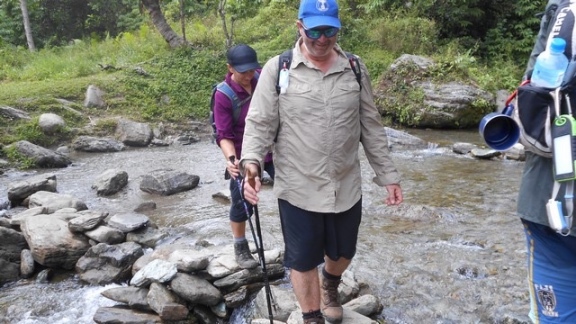 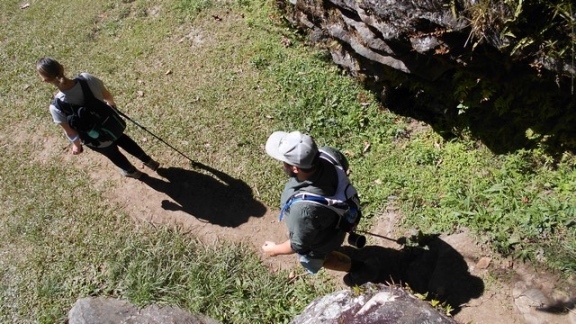 Harold Hauro is the guide for this trek and said everyone did well today – a big day – so tomorrow they will have a short day and head to Menari for the night. 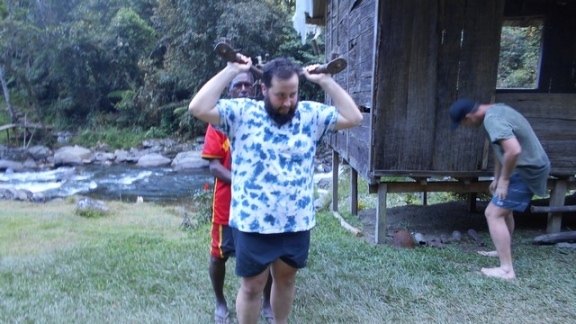 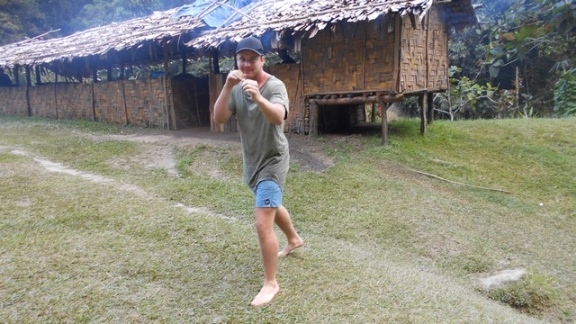 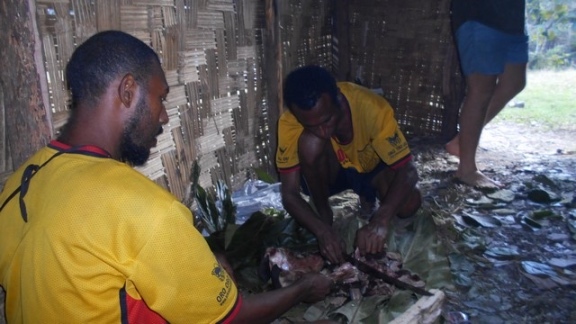 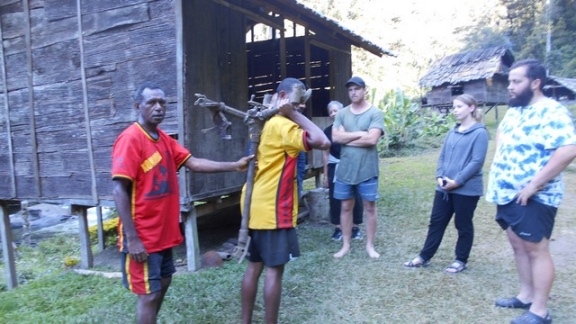 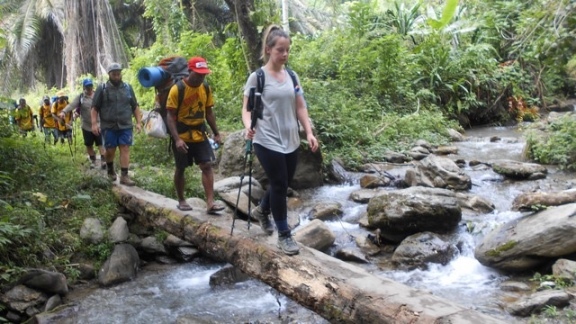 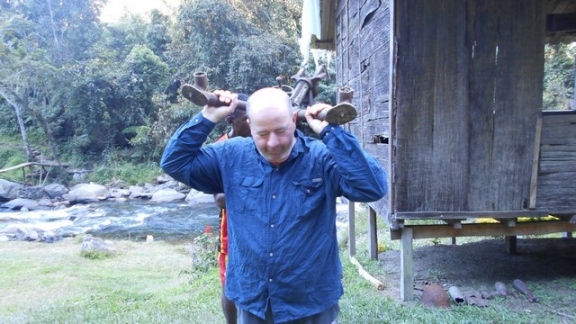 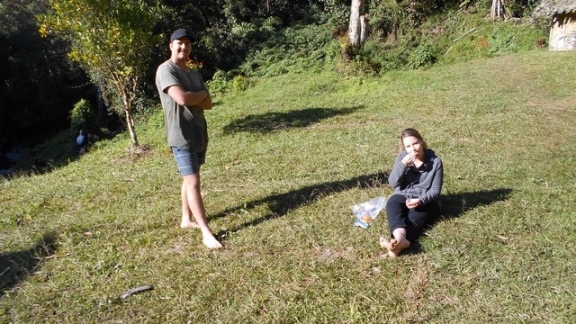 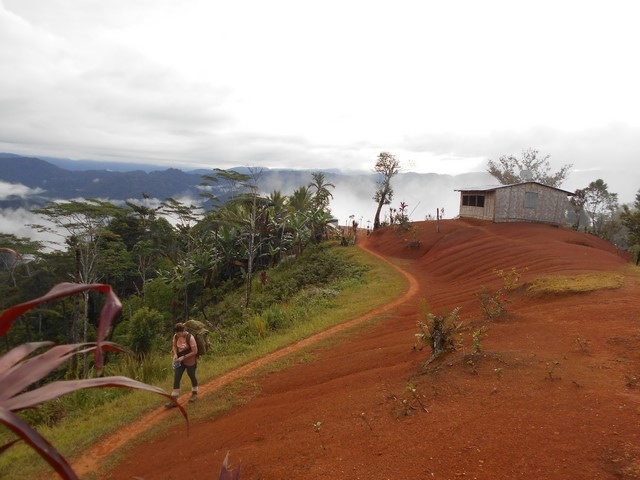 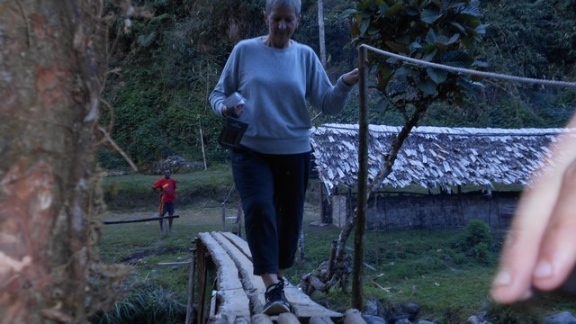 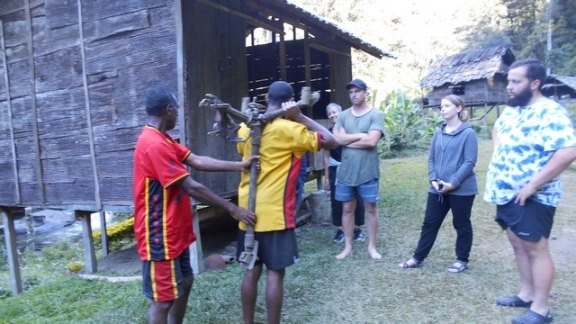 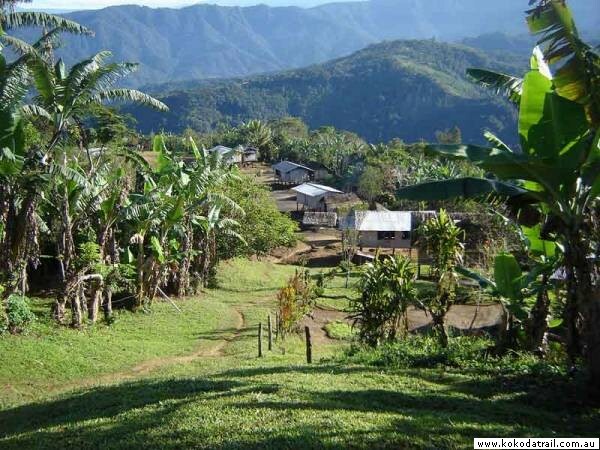 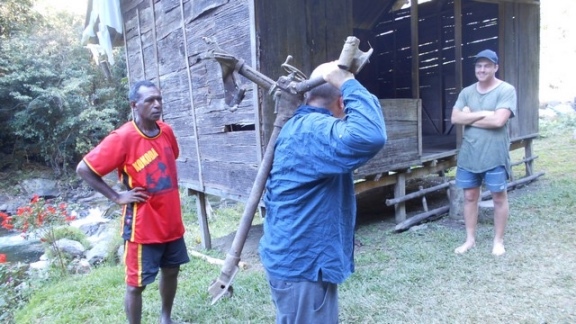 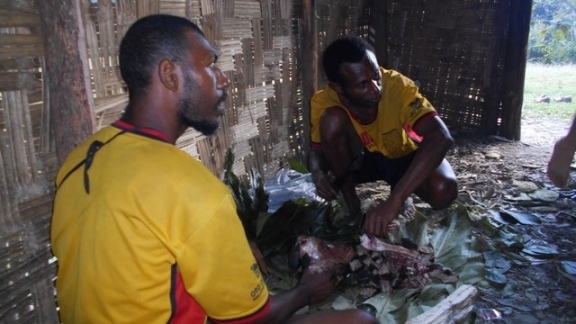 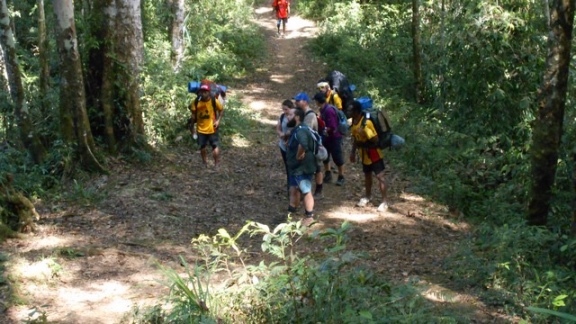 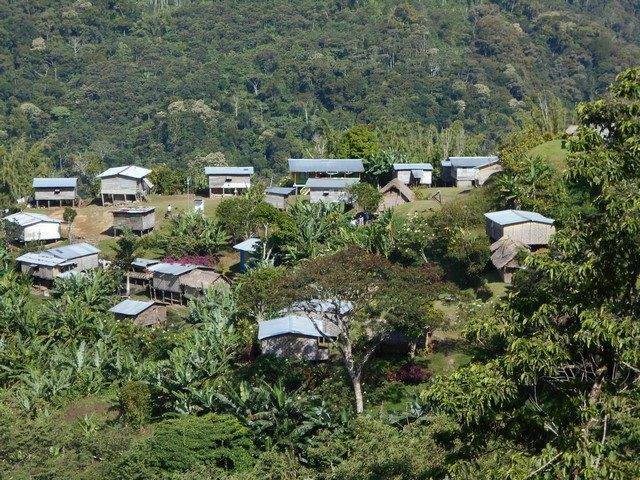 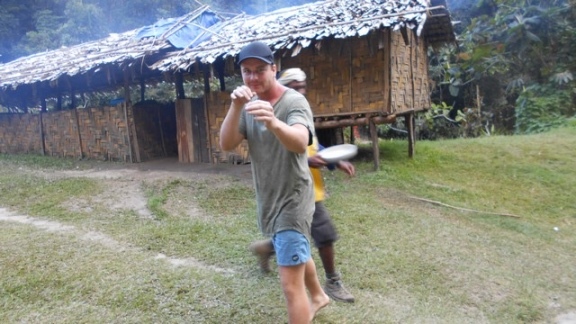 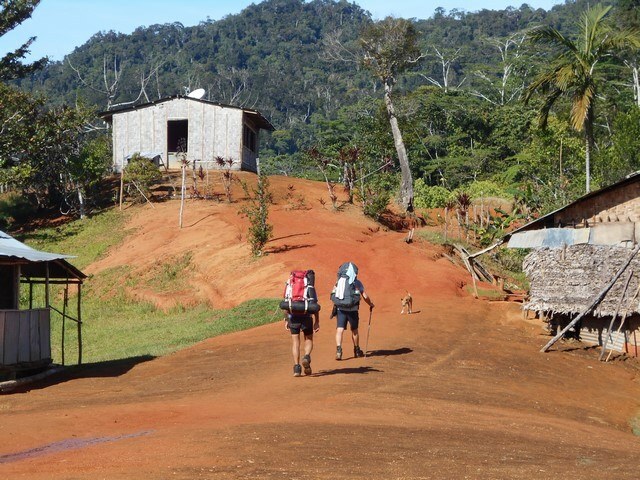 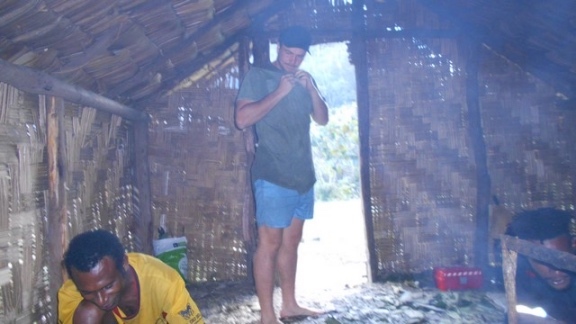 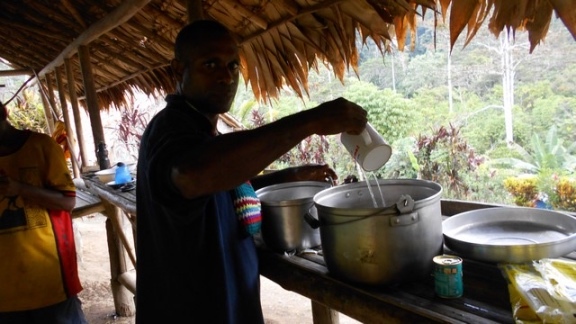 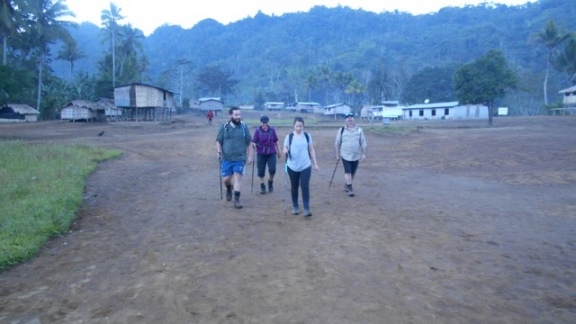 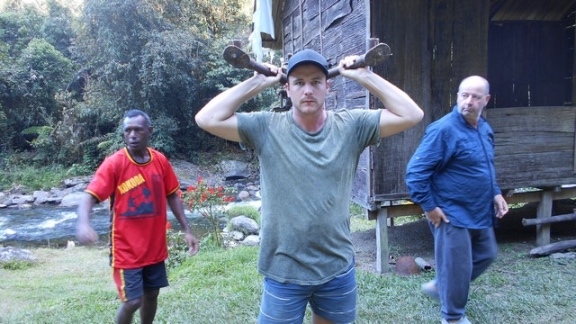 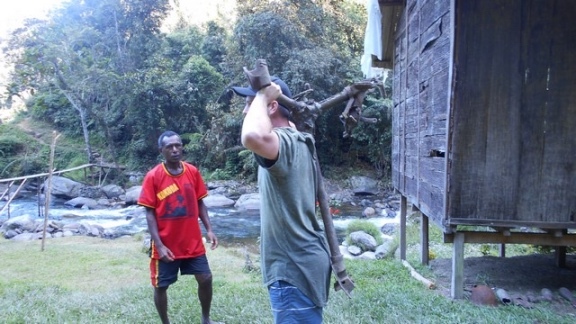 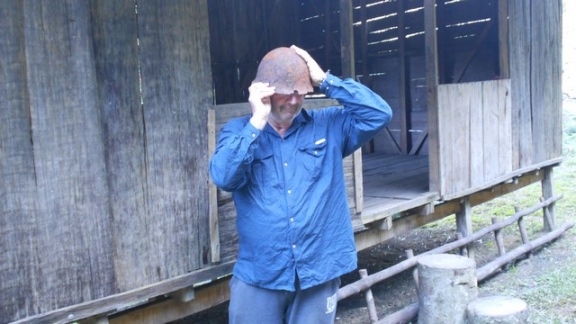 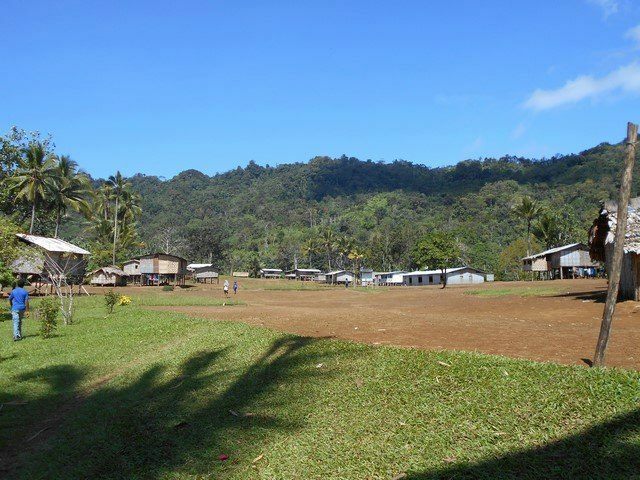 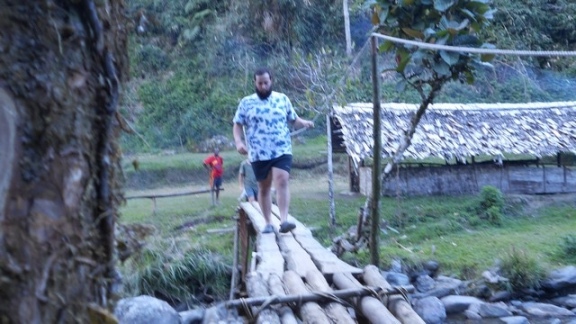 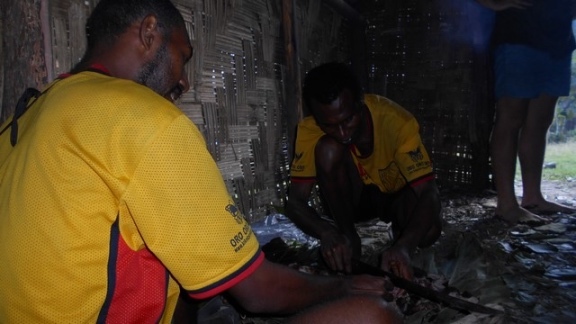 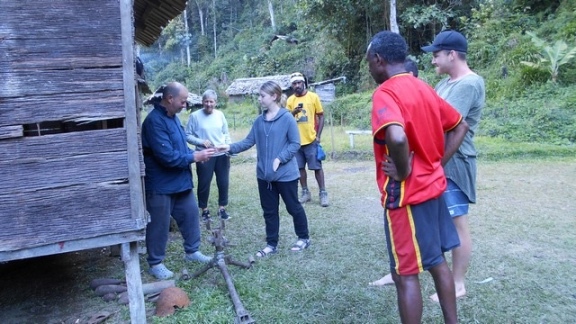 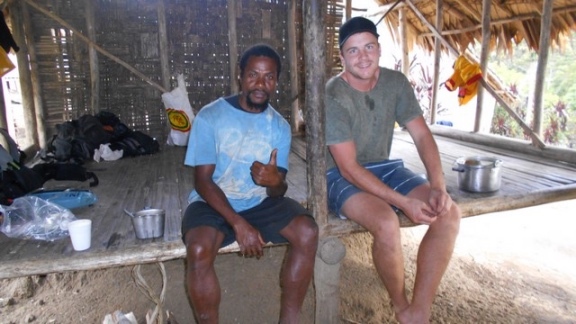 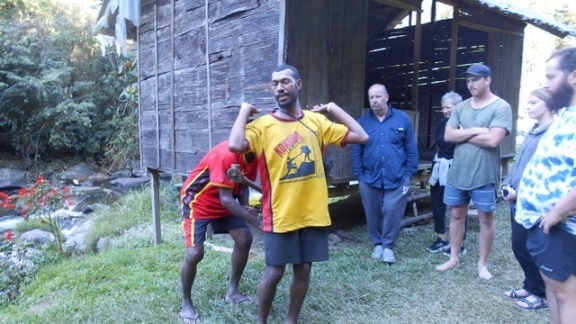 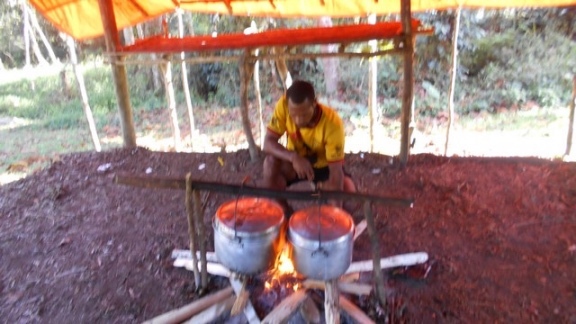 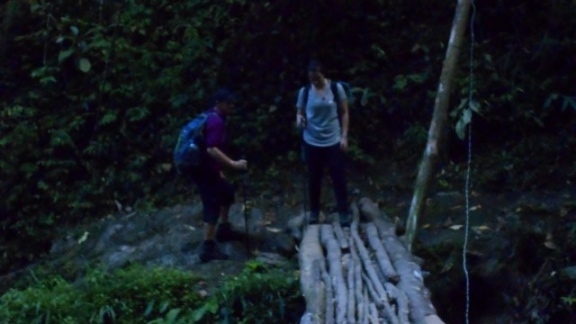 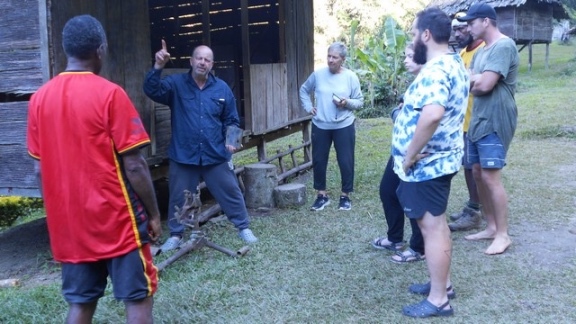 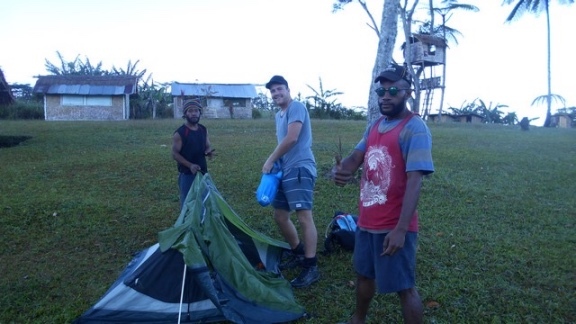 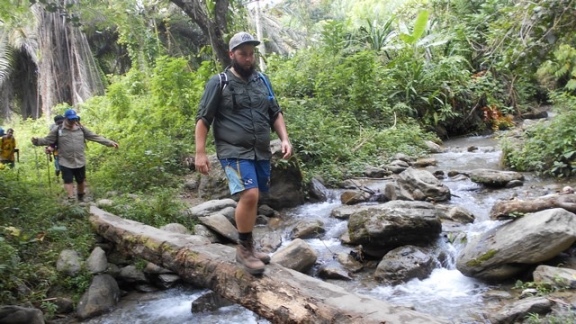 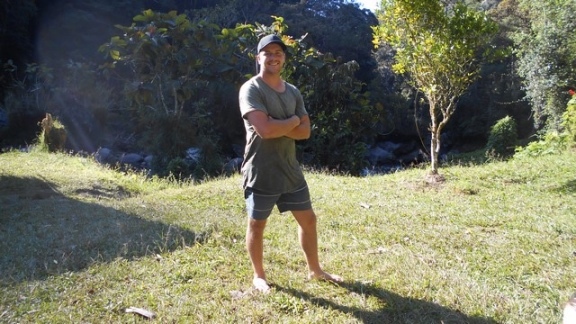 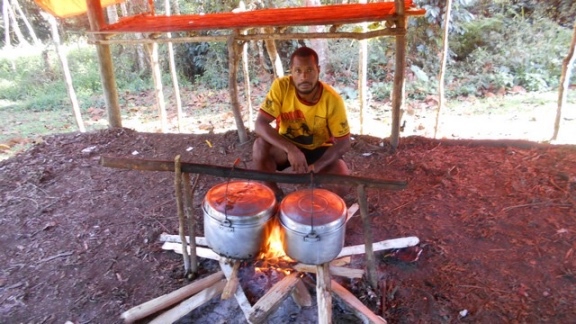 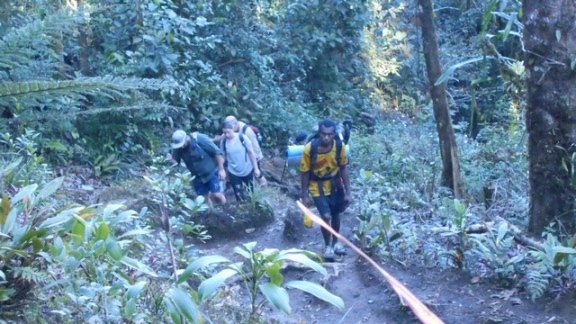 Trek 1123: This trek is now at Menari Village once again, sharing the area with our sub-contract trek so plenty of Kokoda Trekking boys in the village tonight. 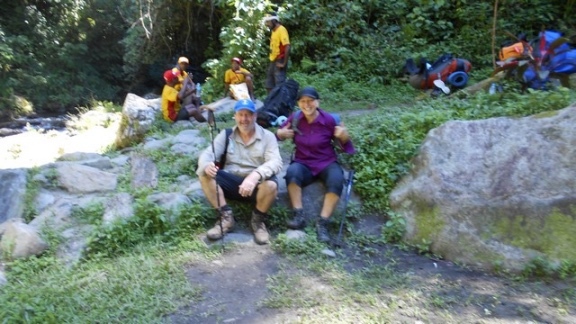 According to Harold, he said his trekkers did well today and are looking forward to another day on the trail tomorrow when they head to Naduri. 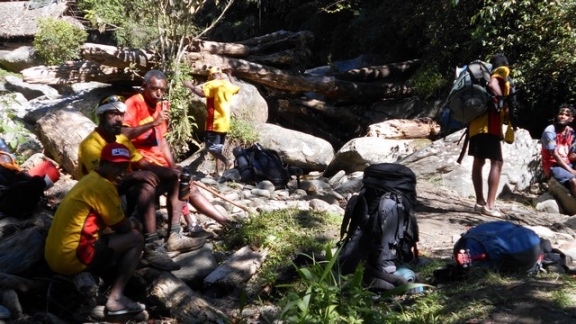 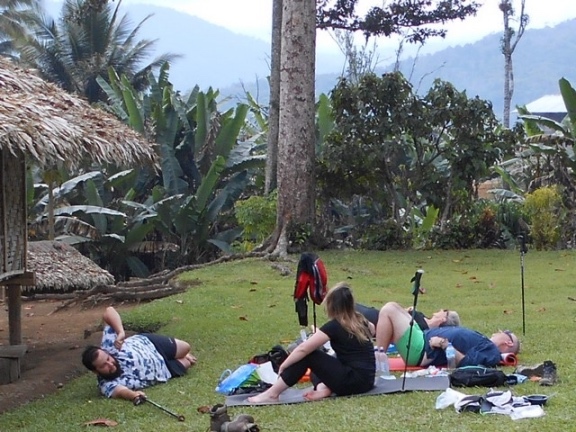 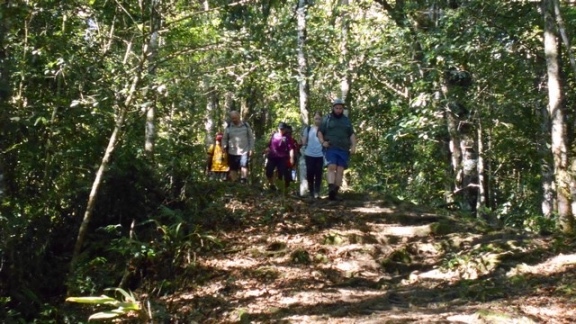 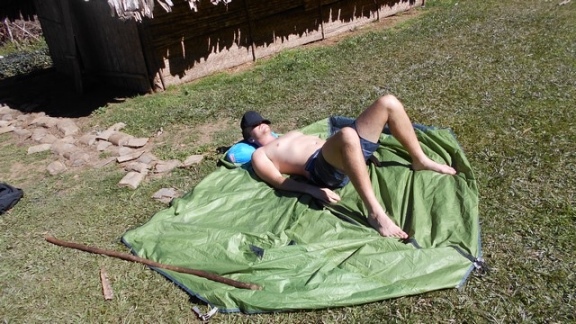 Trek 1123: This group have now reached Naduri for the night. 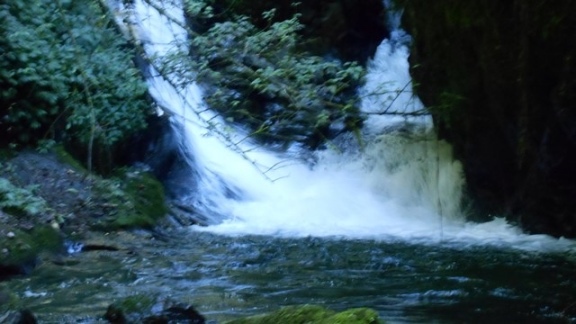 Tomorrow they will head to Templeton’s II. 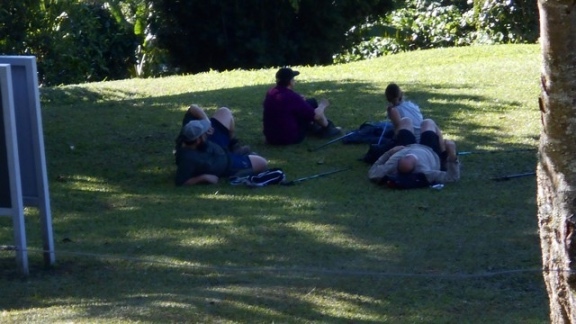 According to Harold, everyone is fine with no problems. 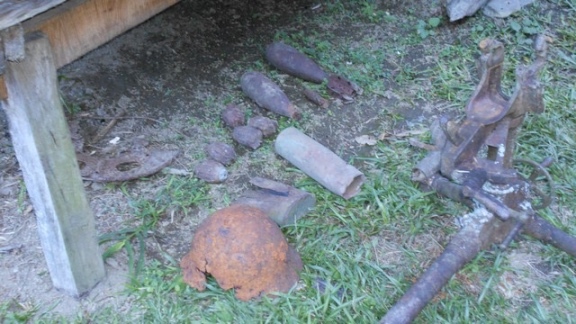 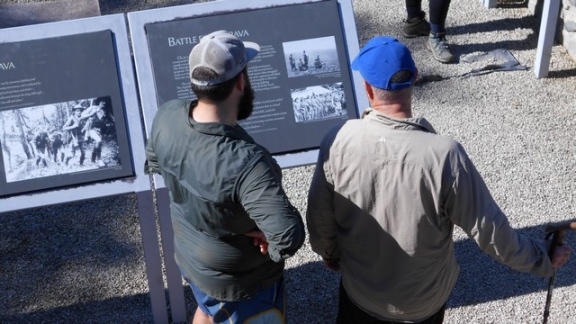 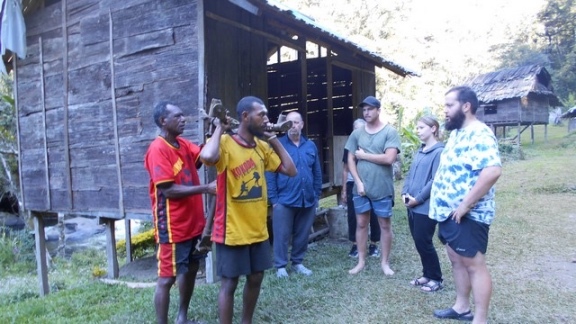 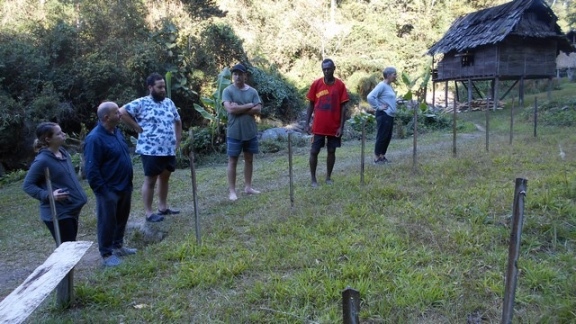 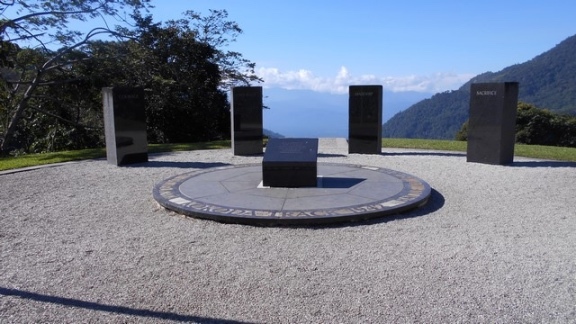 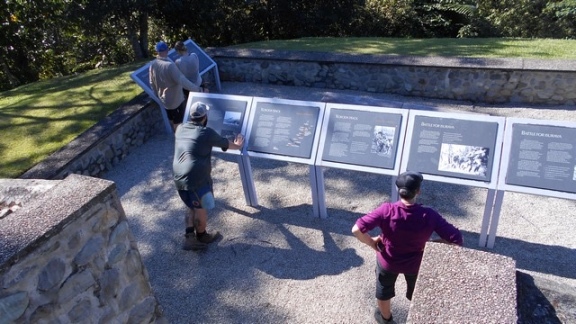 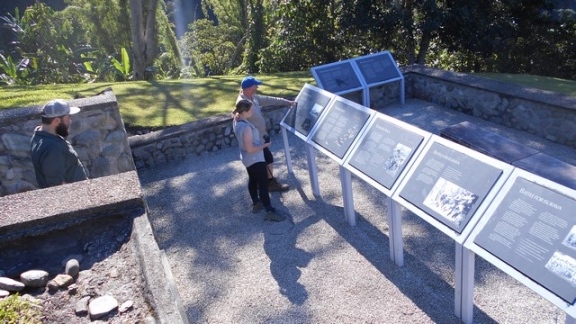 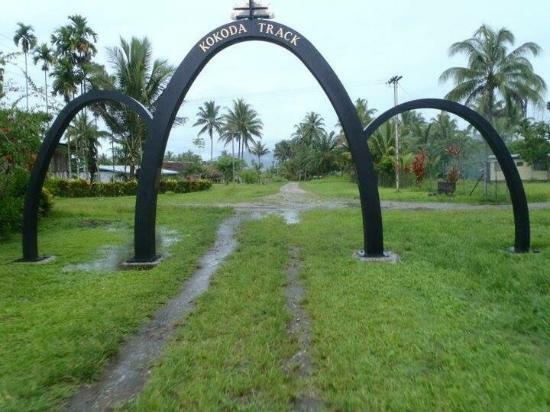 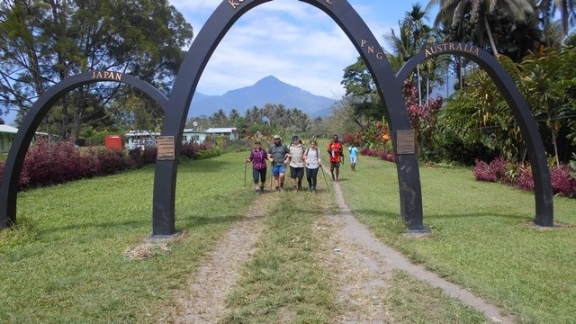 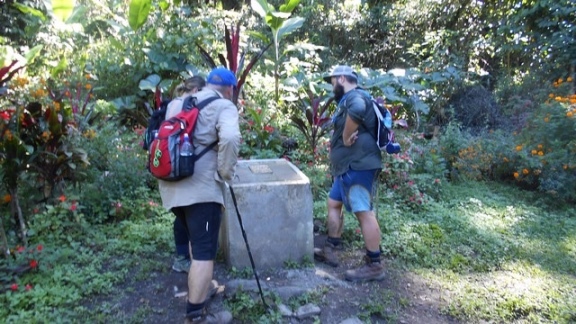 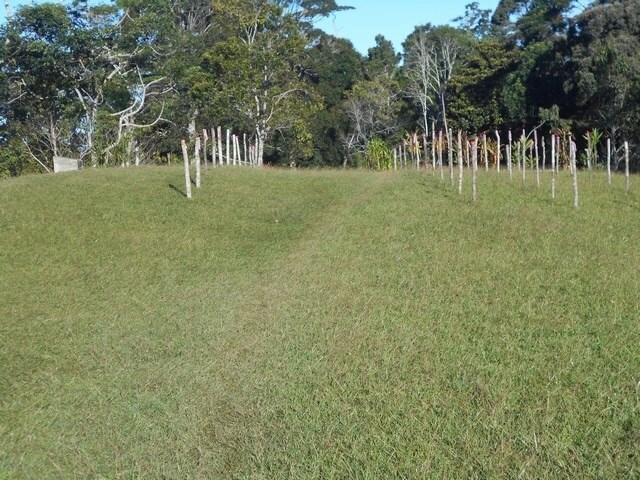 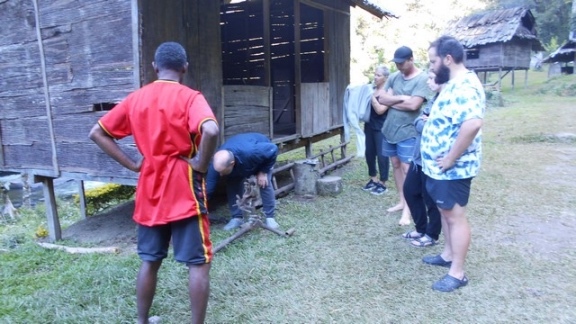 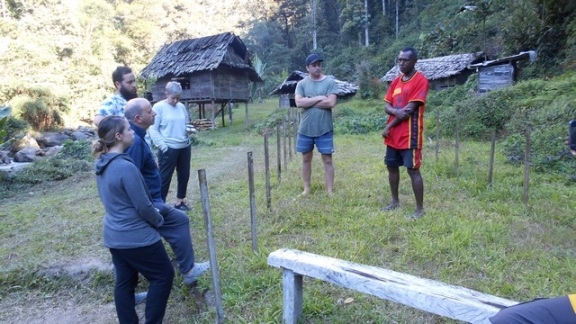 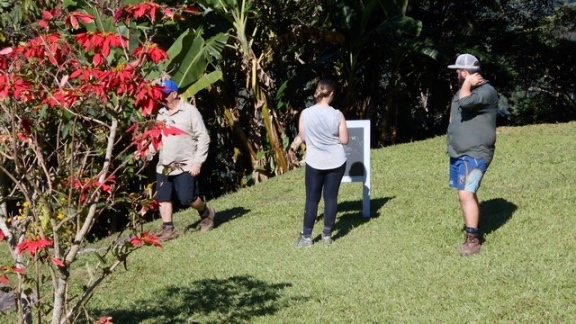 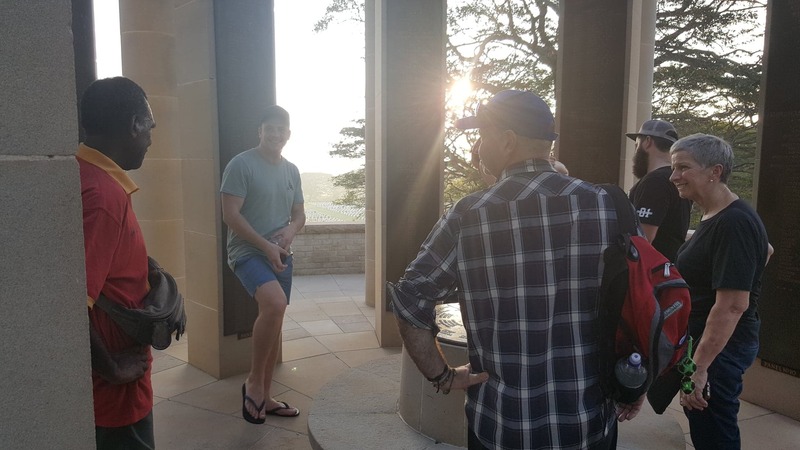 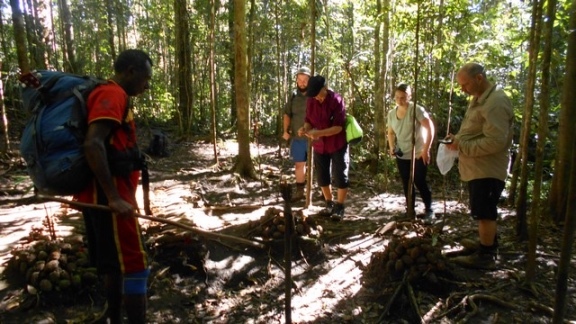 At Naduri they see the newly installed plaque, joint effort by iPi (Lae); Zac Zacharias; Nikki George and the team from the Kokoda Memorial Foundation (Eric Winn) and his team, same as who installed the archways at both ends of the track. 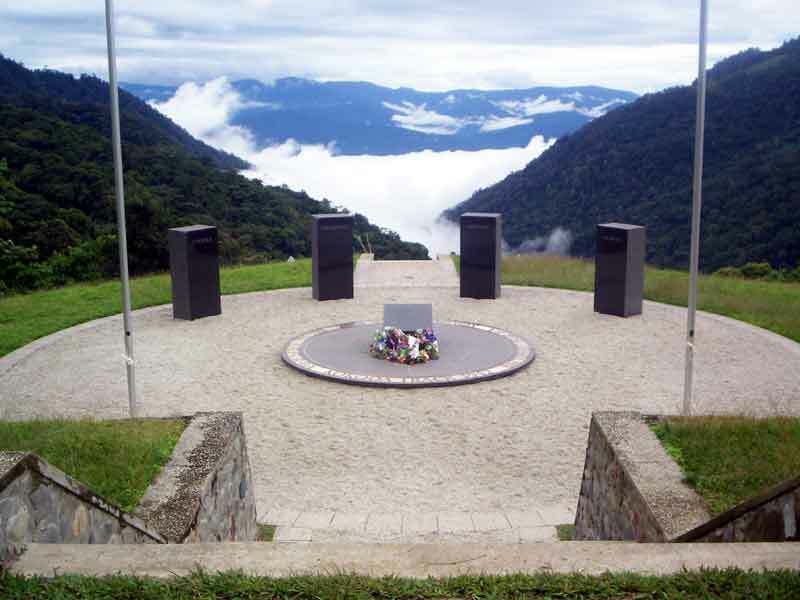 Tribute to the Fuzzy Wuzzy Angels. 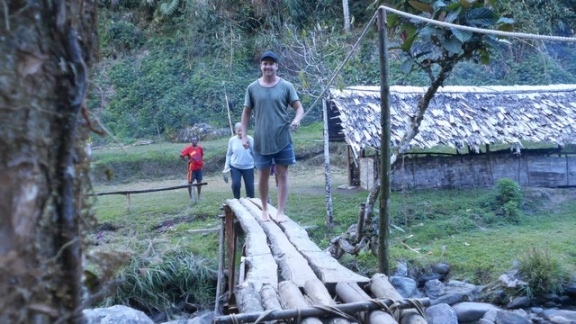 Trek 1123: This trek now finds themselves at Templeton’s Crossing for the night. Tomorrow the edge further to the finish line when they head for Isurava Village so they can be perfectly positioned to walk off the track on the 24th July. 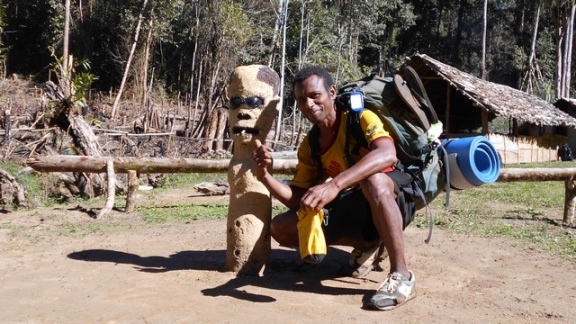 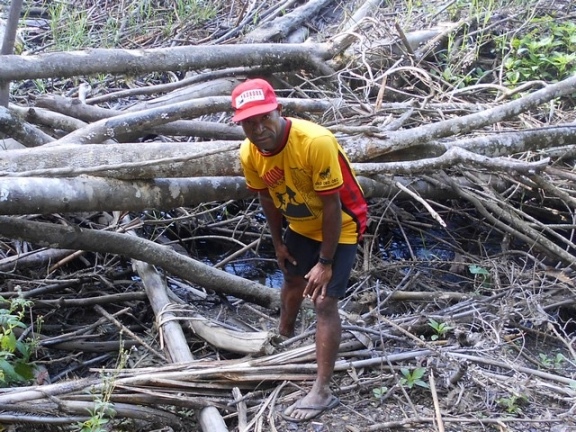 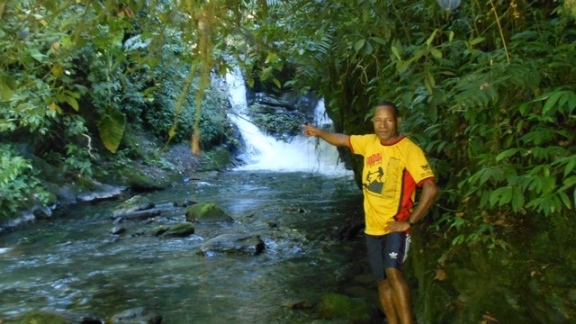 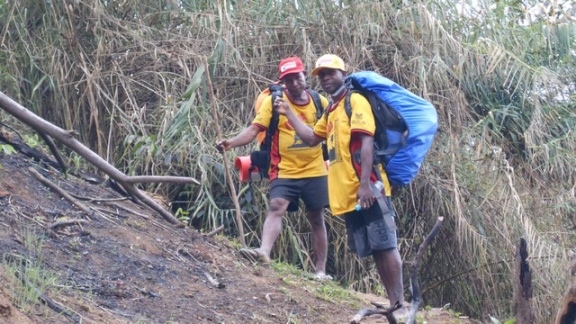 Trek 1123: Have not heard from Harold today but when I spoke to him last he informed me they would stop at Alola or Isurava as they walk off the track tomorrow. 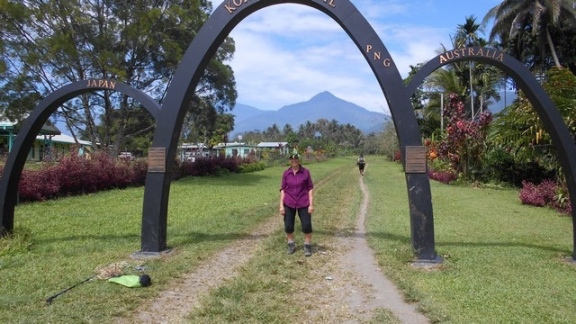 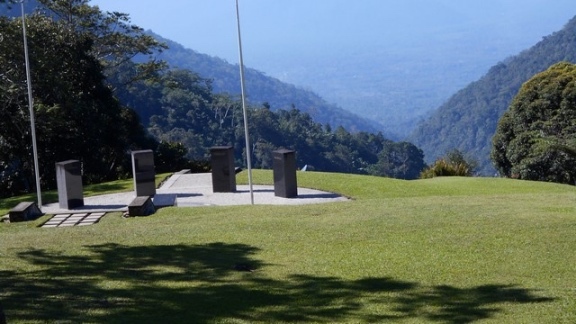 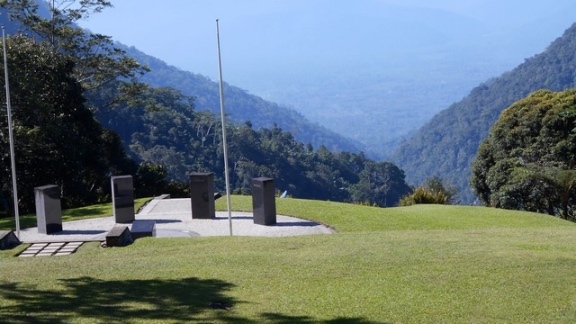 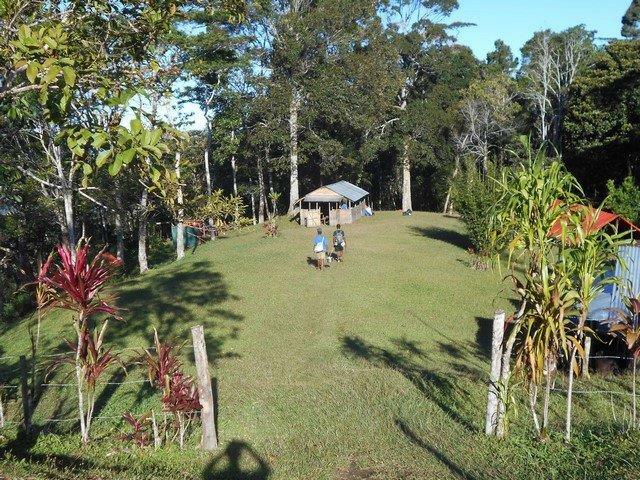 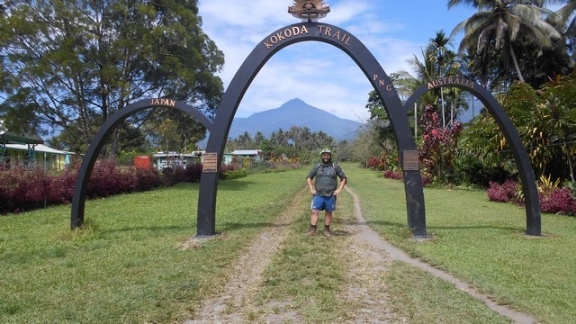 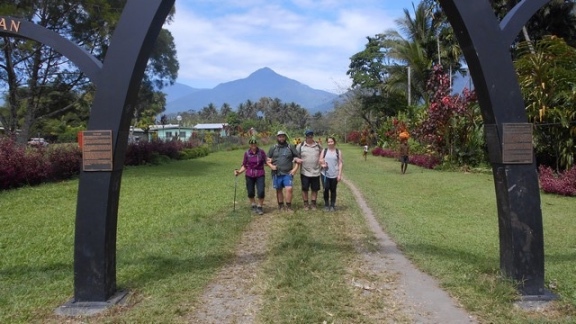 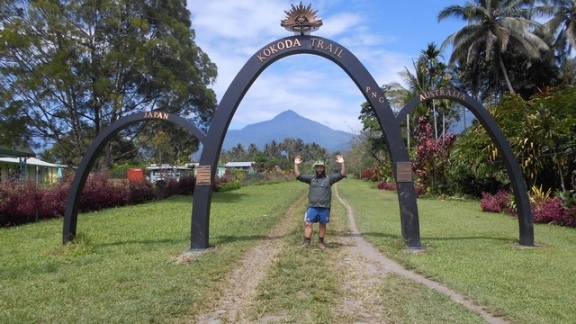 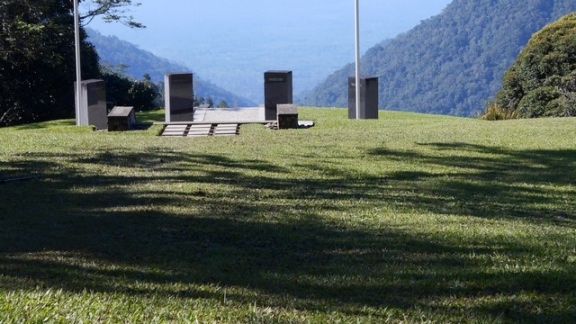 Not far now and they will be walking under the Kokoda archway celebrating their walk across the Kokoda Trail. 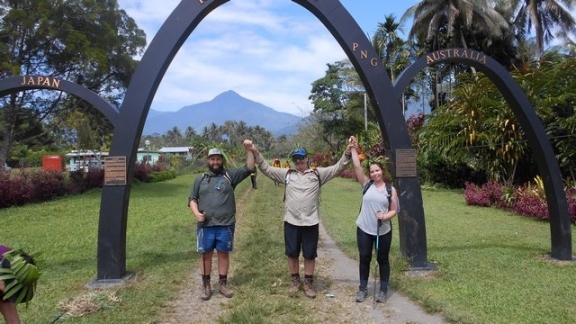 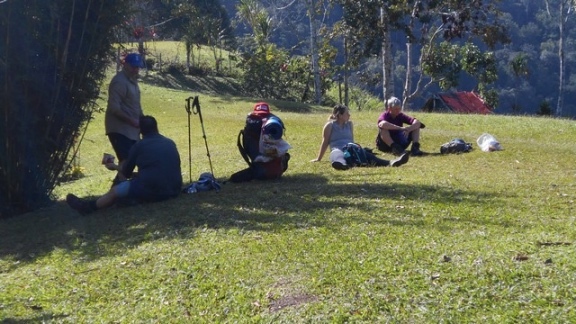 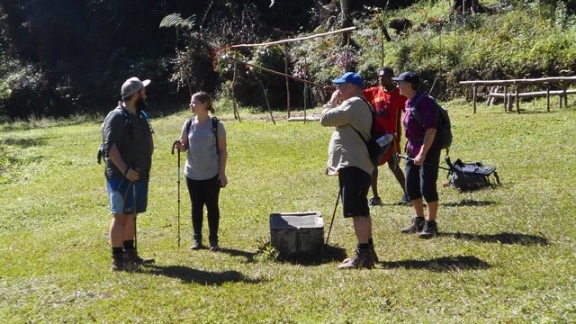 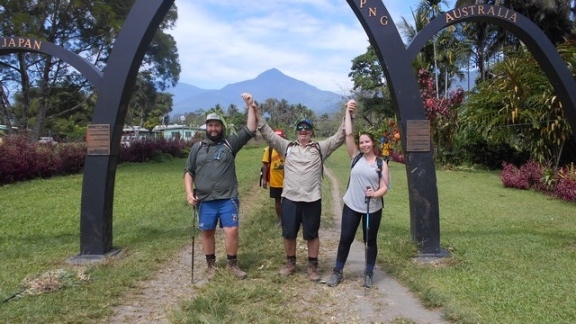 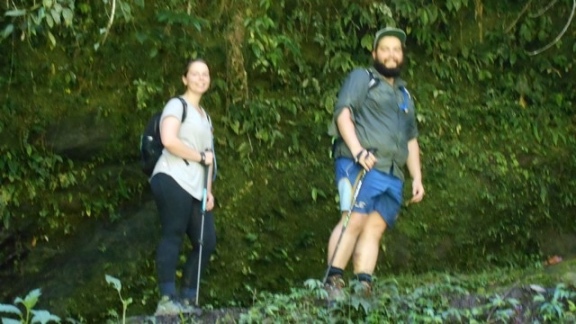 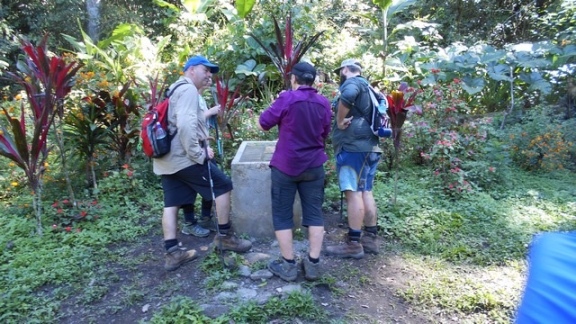 Trek 1123: Congratulations to this group as they have walked off the track this afternoon and are now in Kokoda relaxing at the archway. 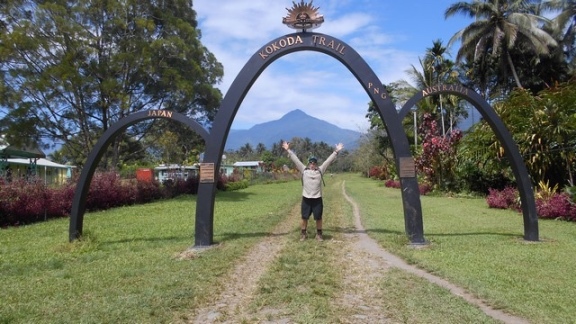 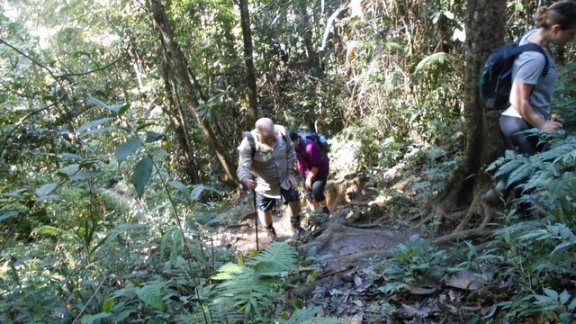 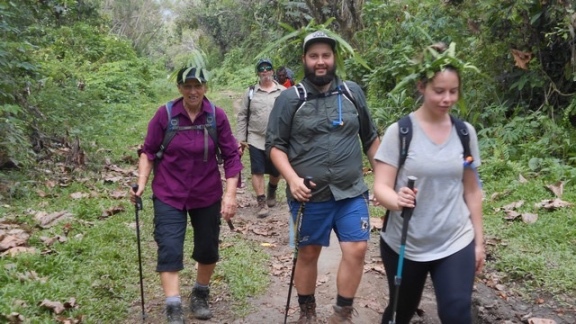 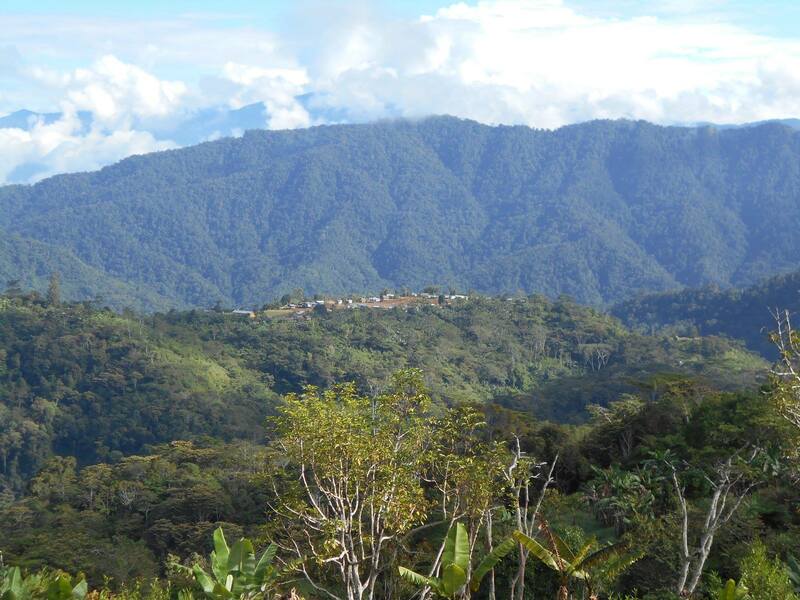 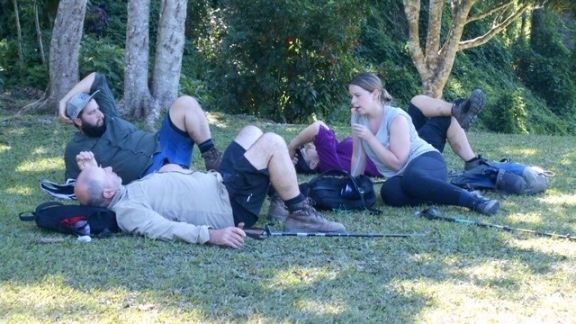 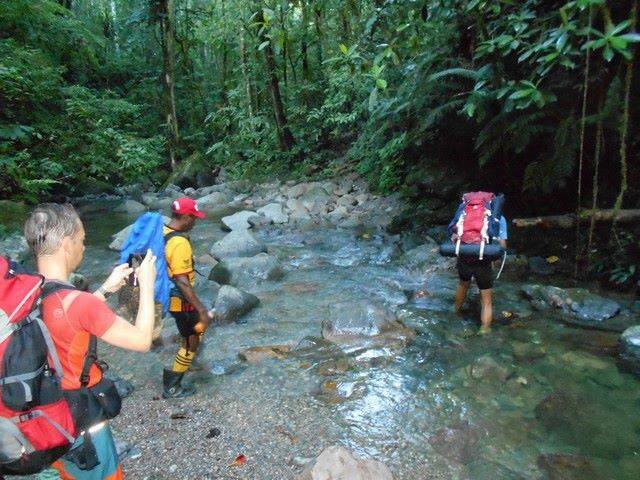 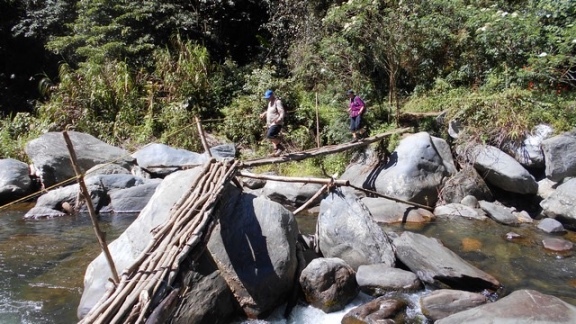 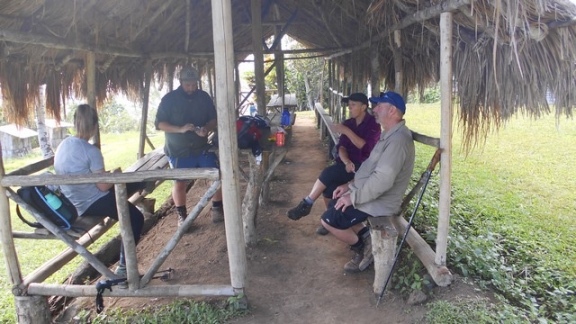 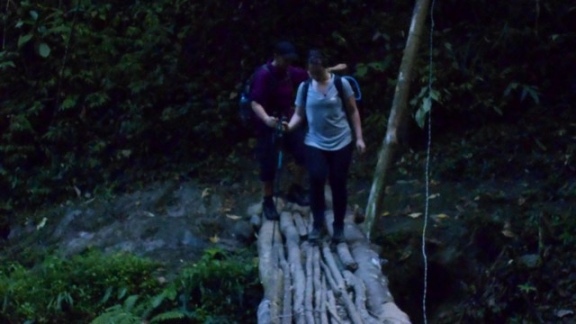 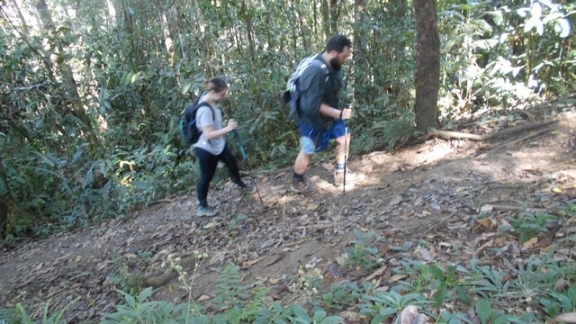 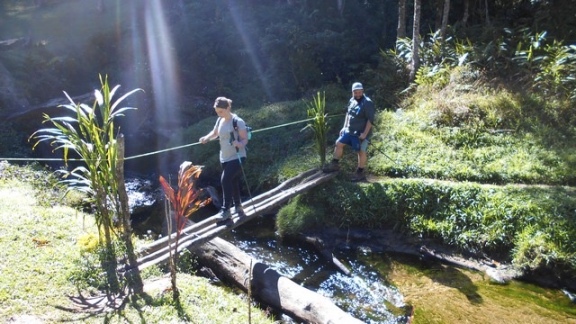 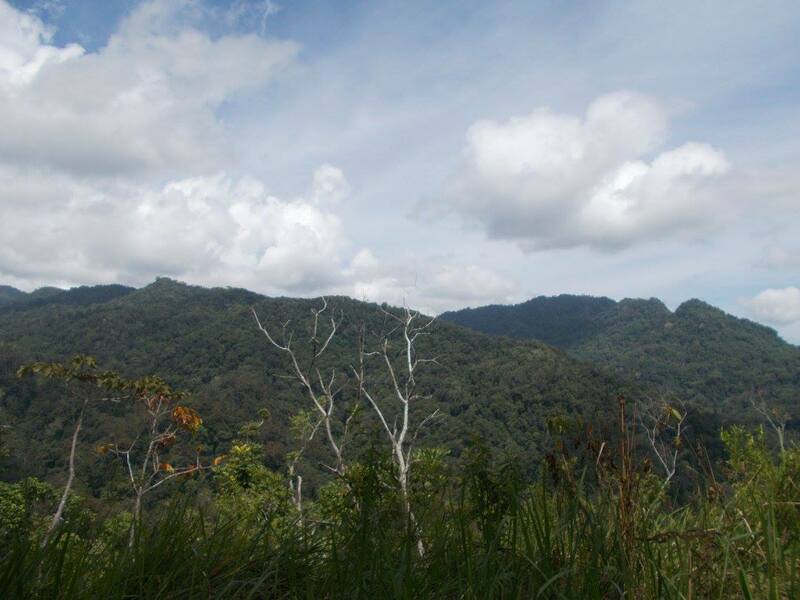 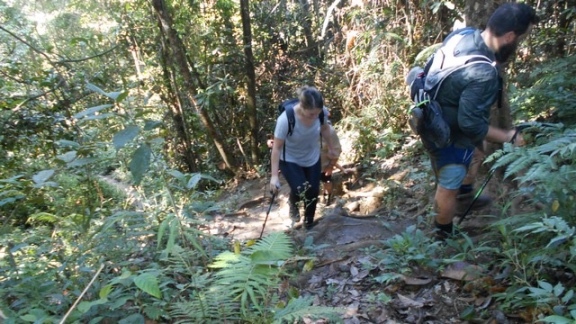 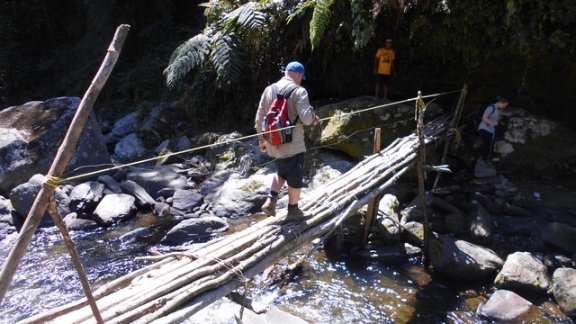 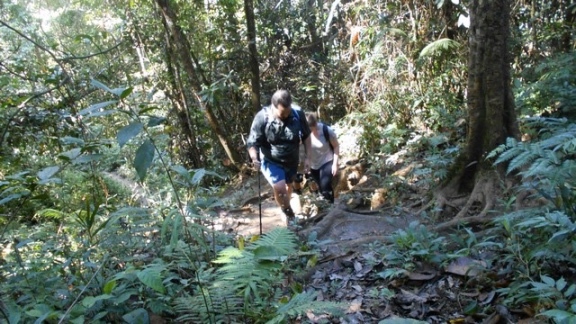 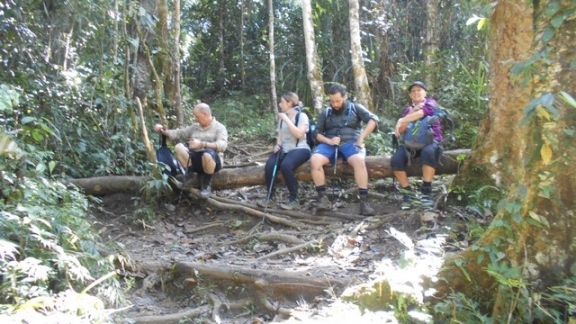 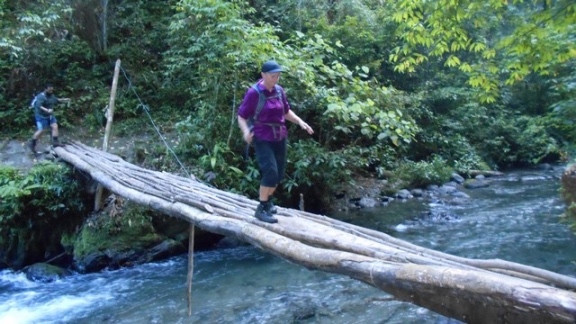 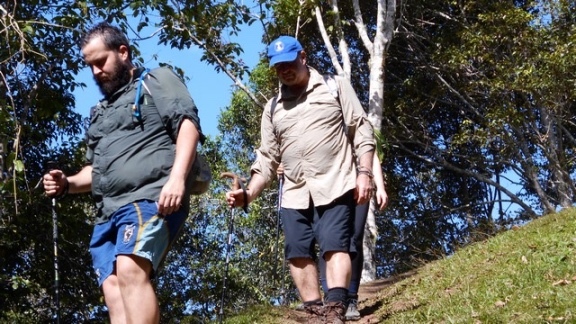 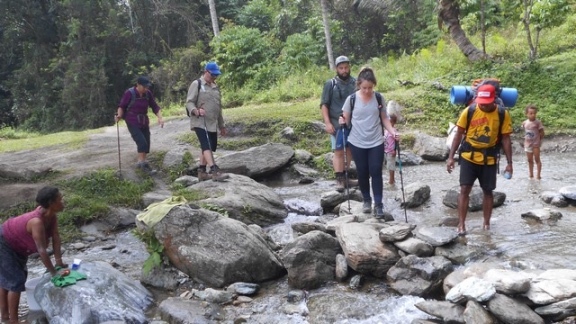 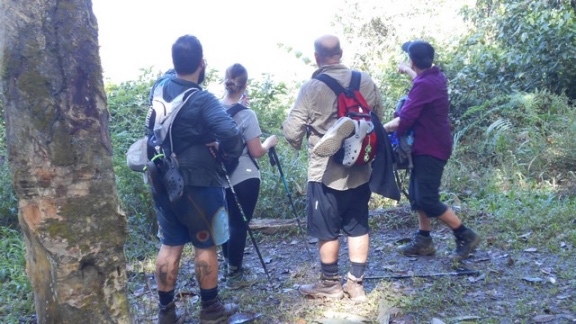 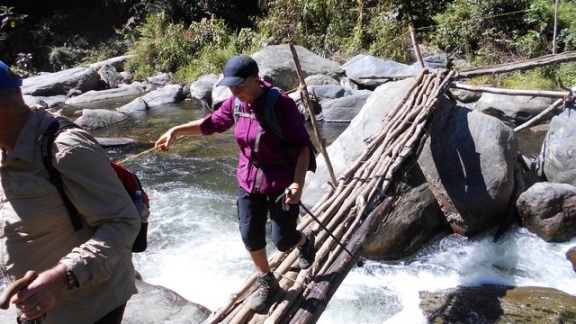 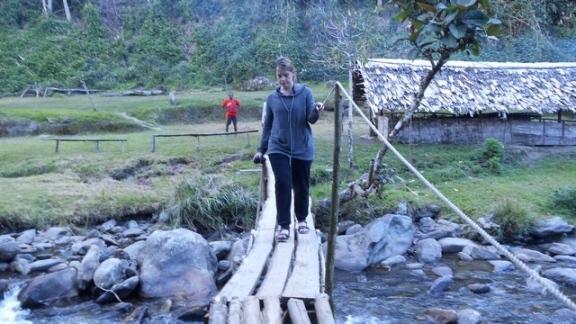 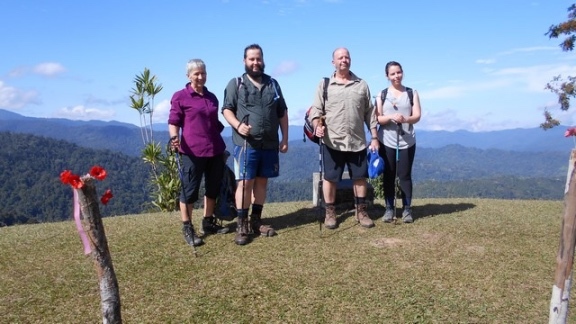 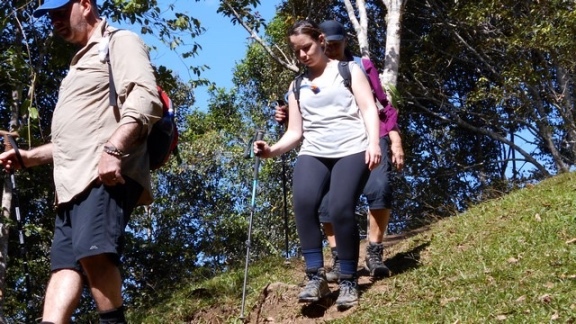 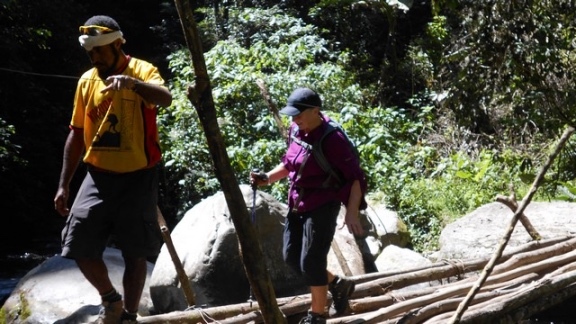 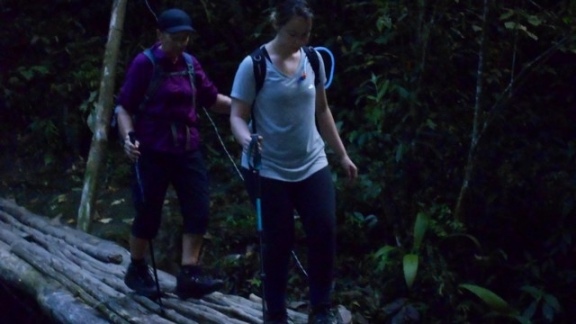 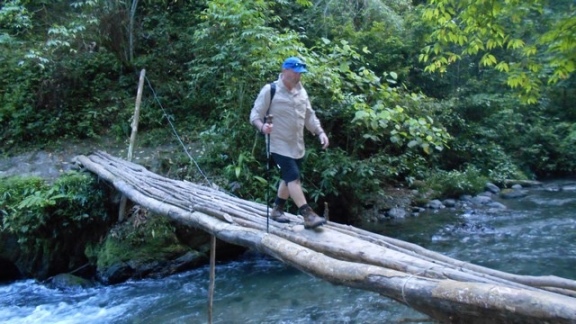 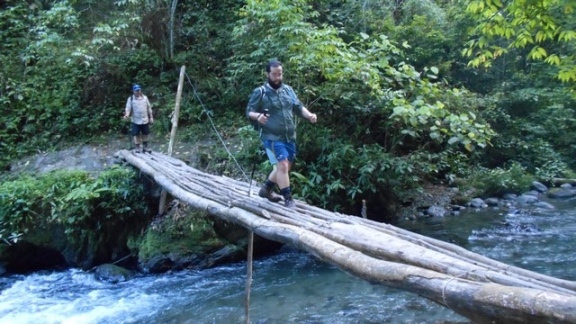 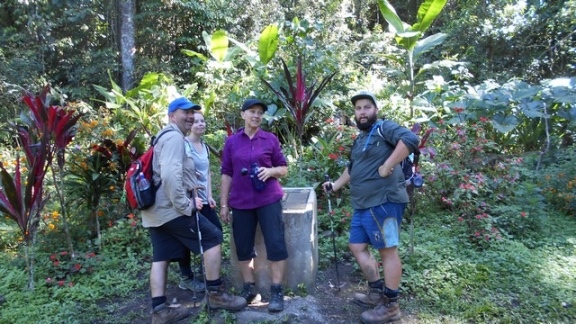 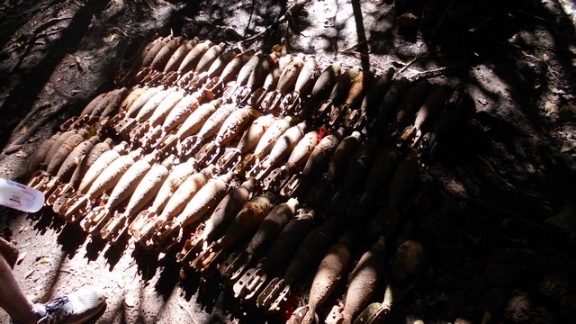 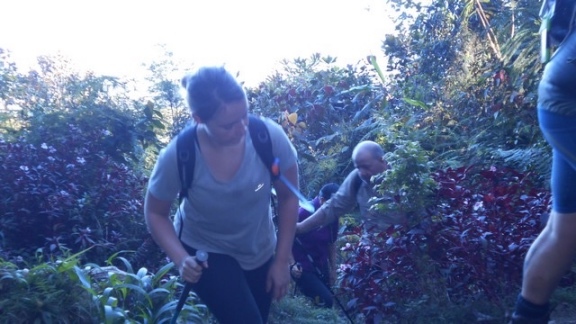 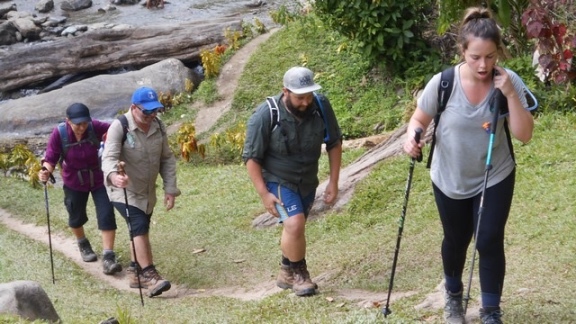 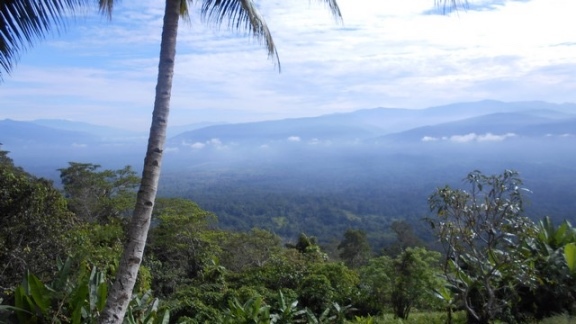 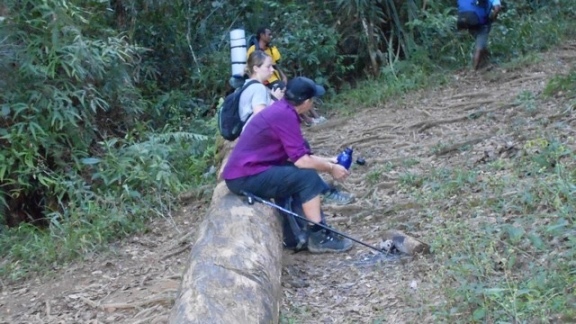 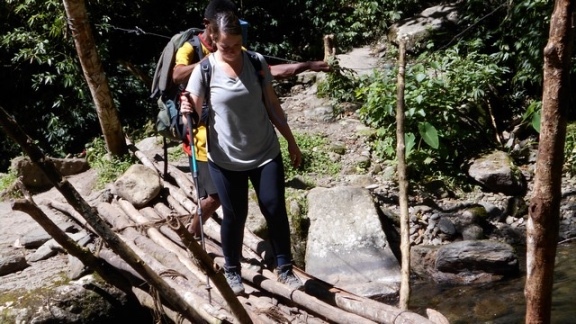 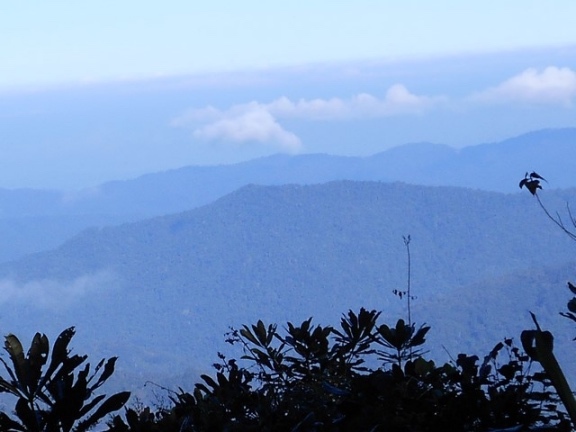 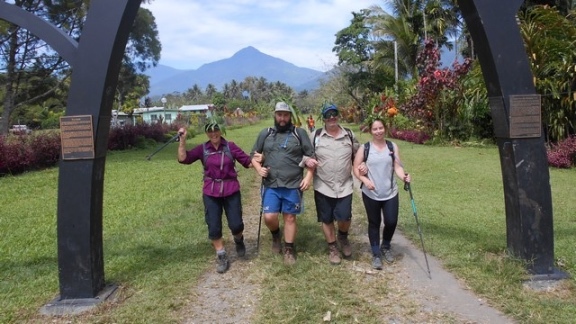 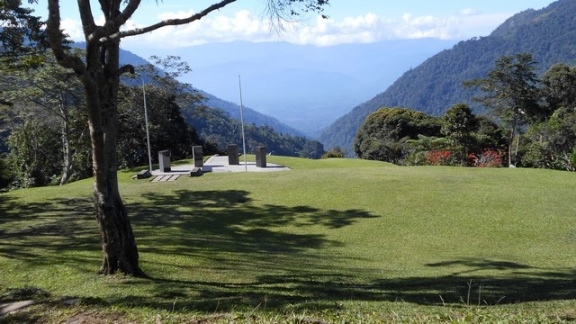 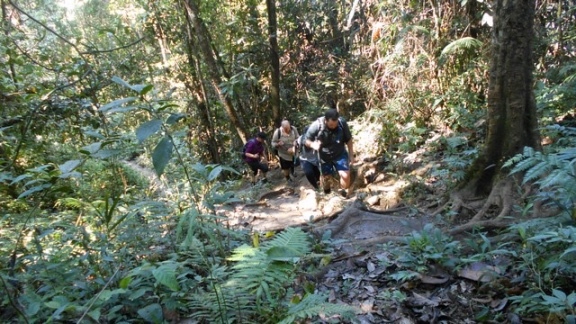 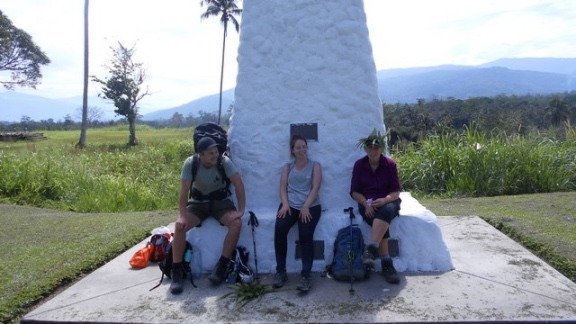 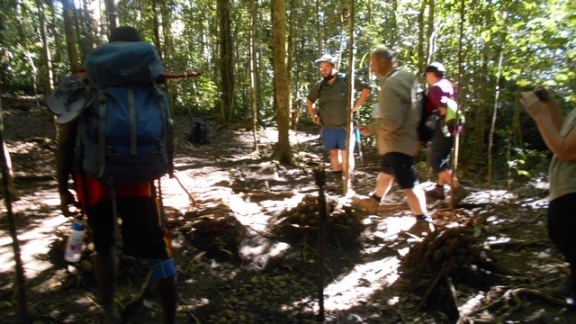 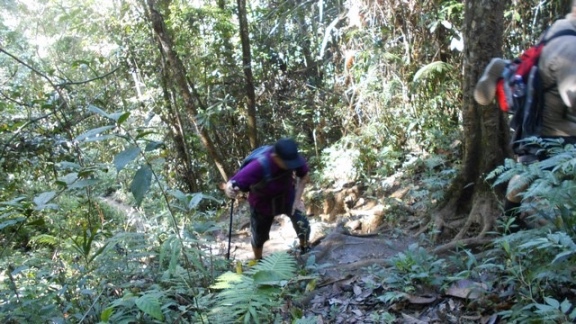 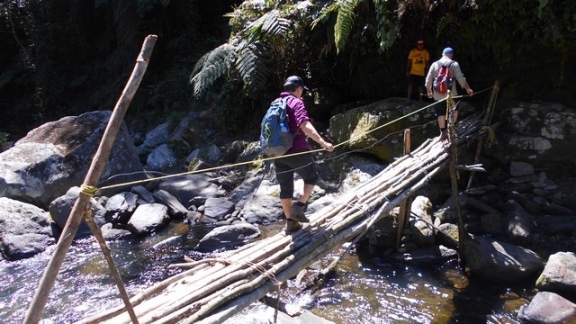 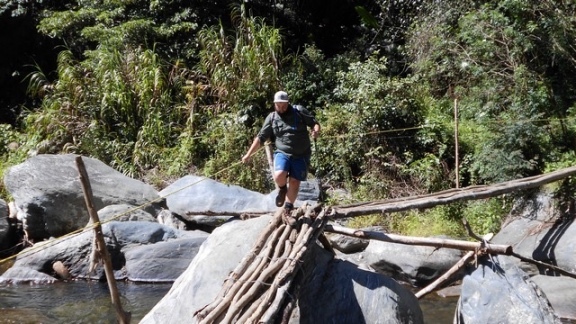 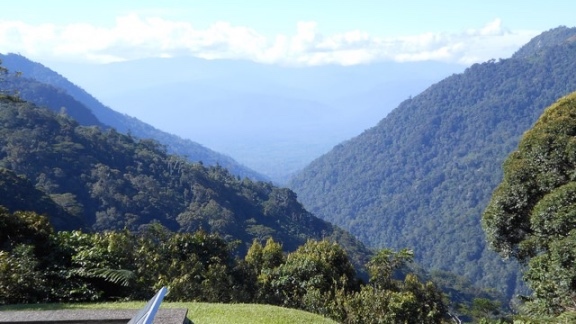 Well done everyone from all of us here at Kokoda Trekking. 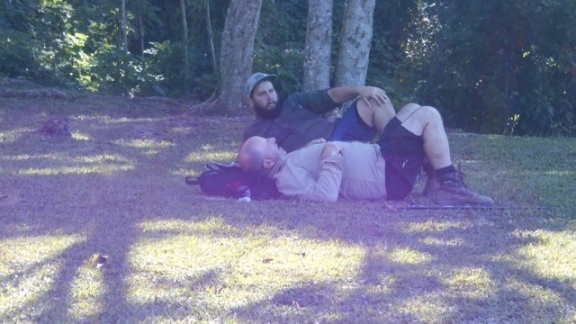 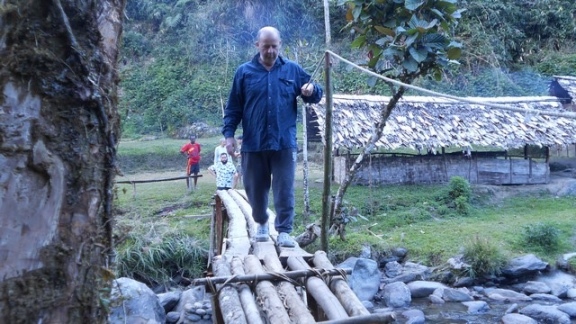 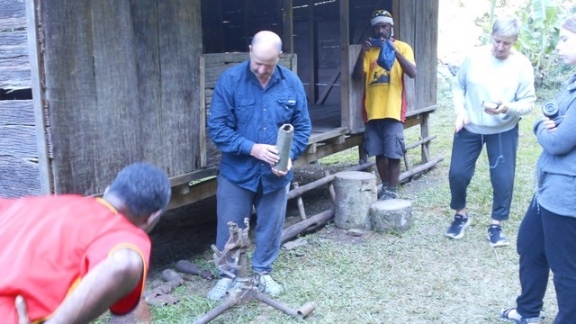 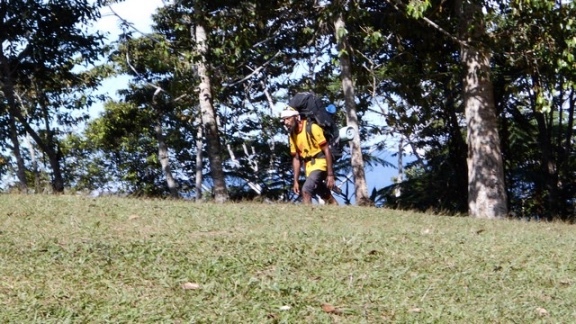 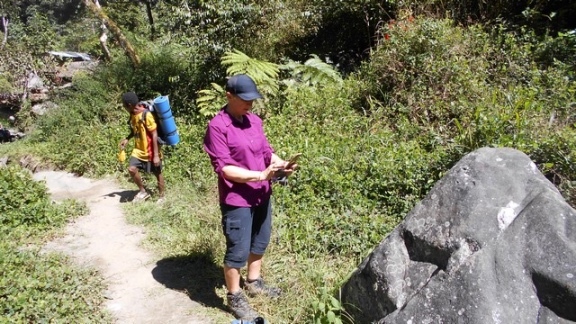 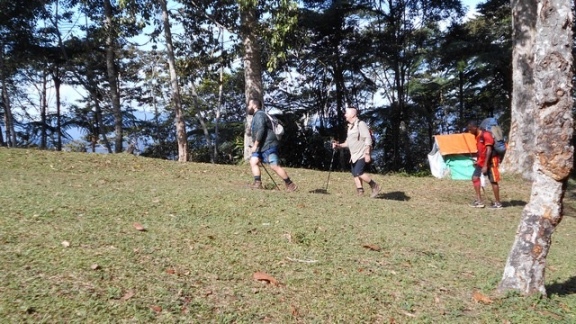 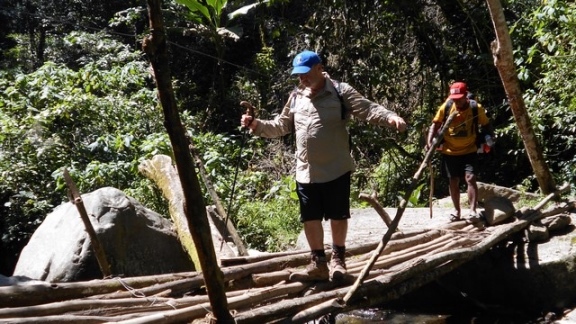 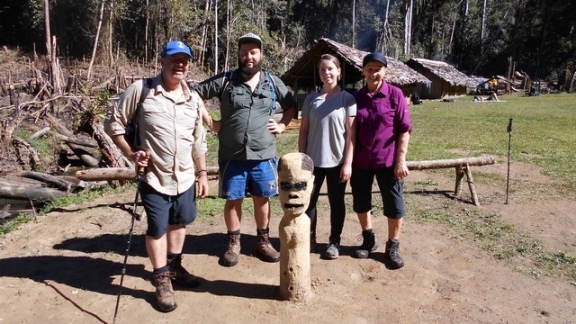 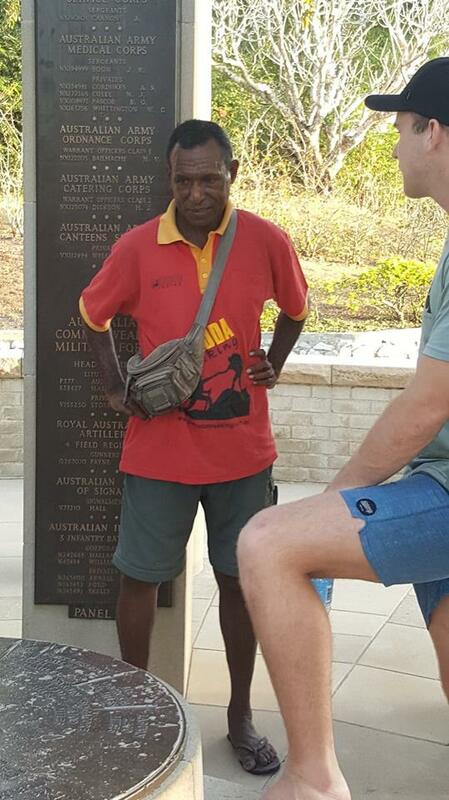 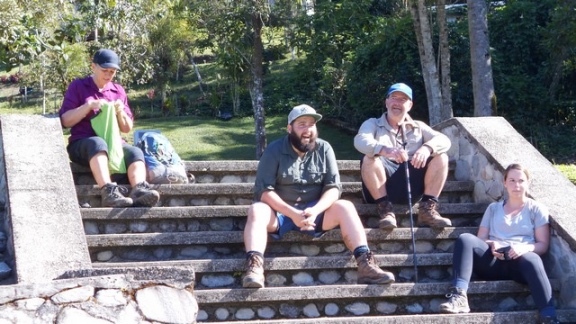 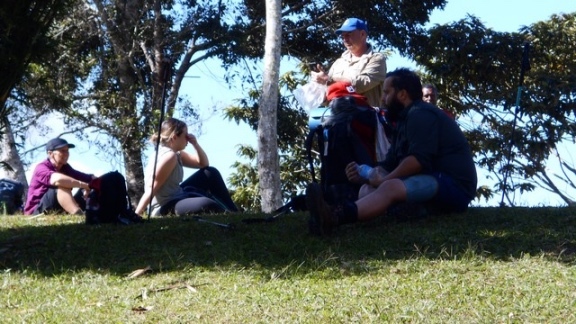 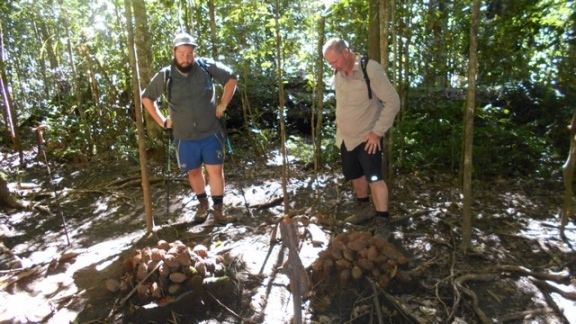 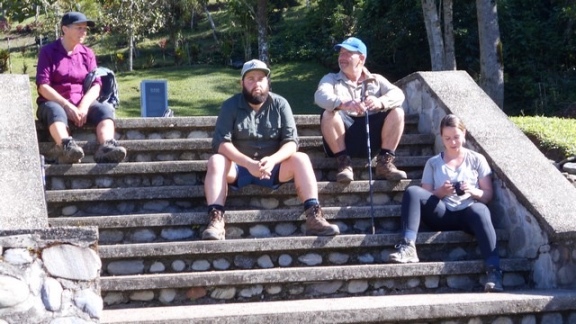 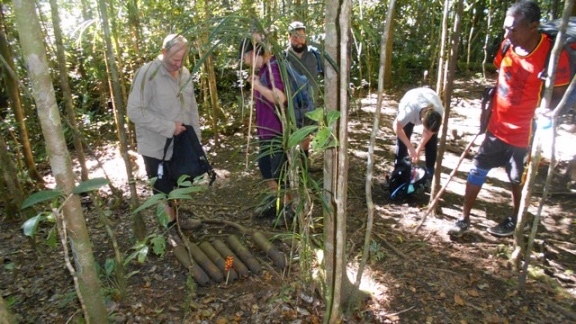 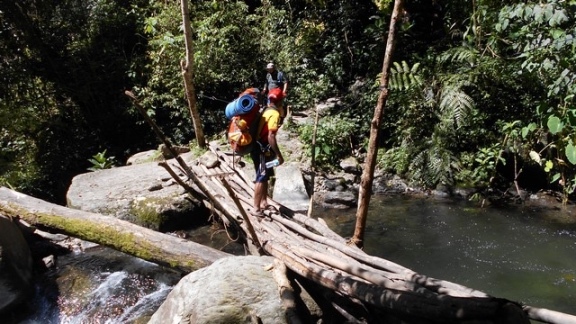 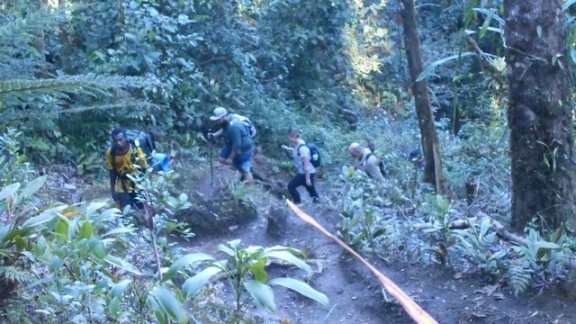 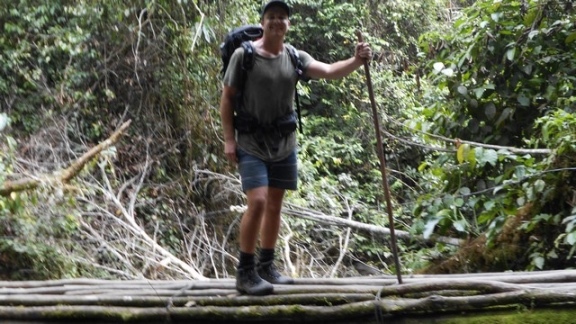 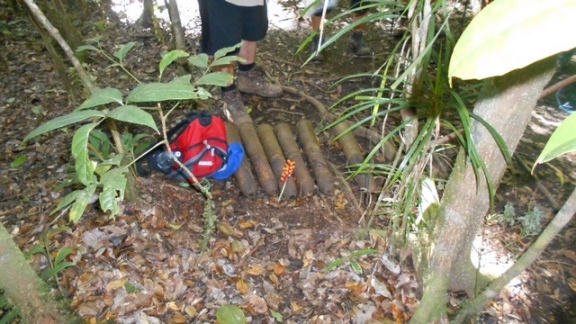 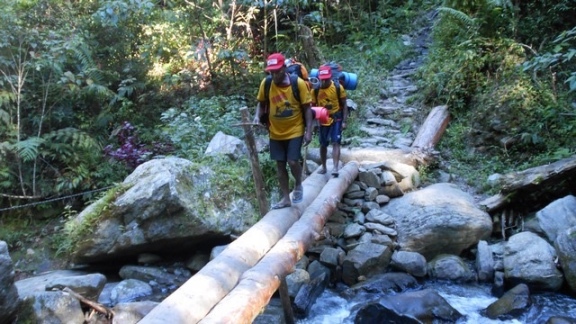 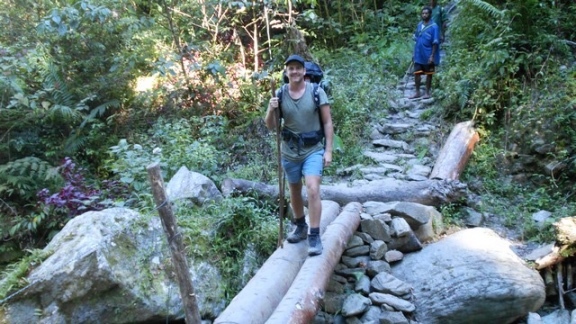 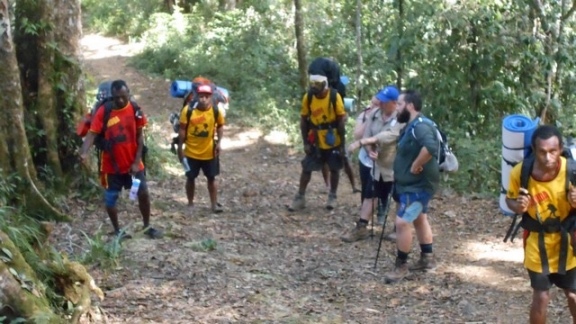 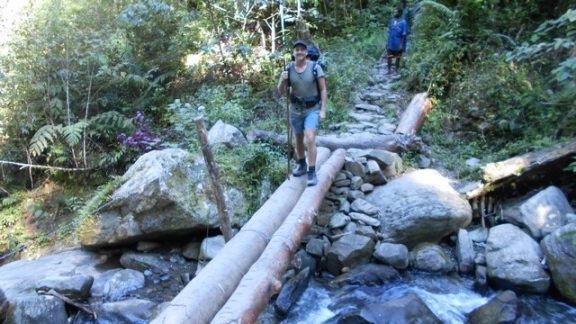 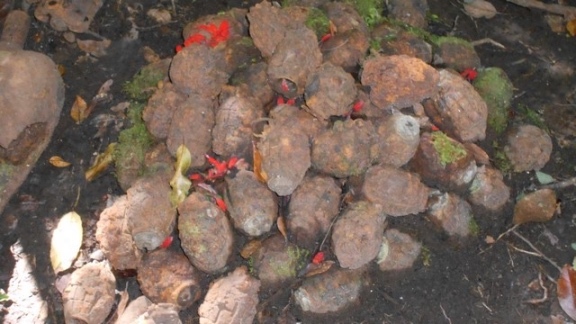 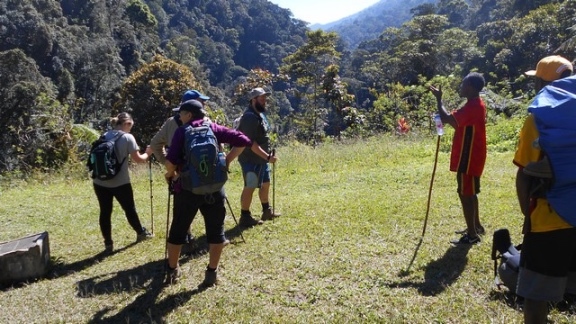 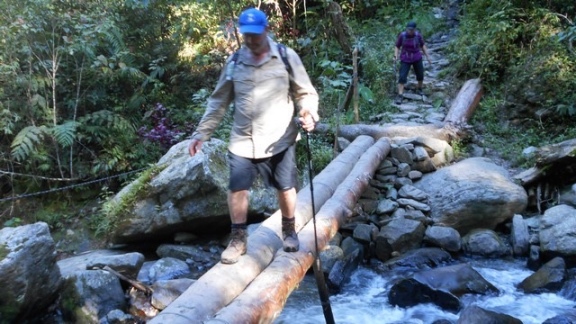 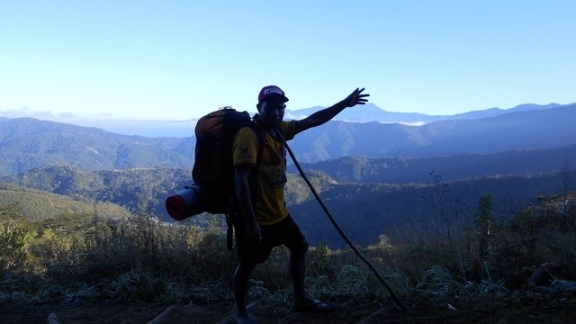 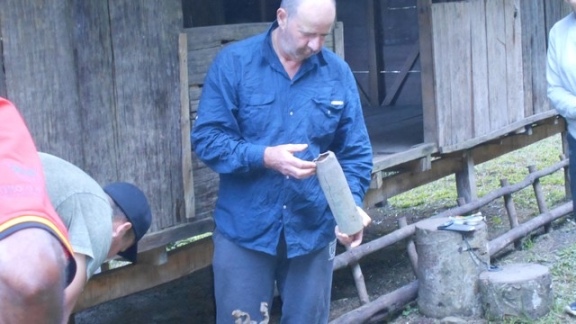 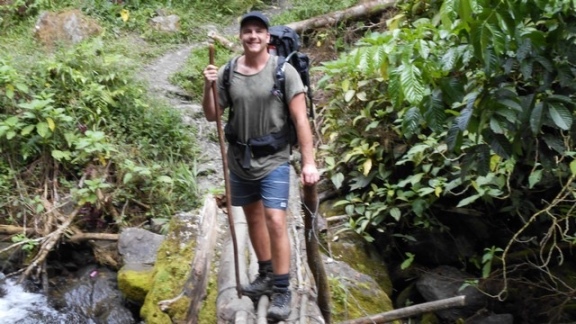 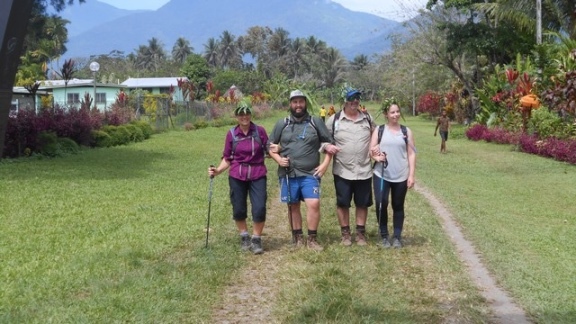 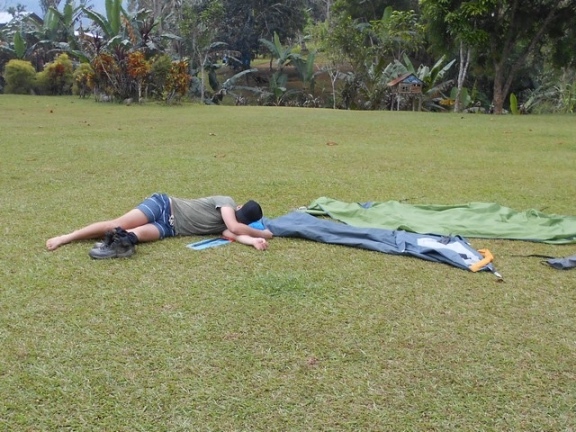 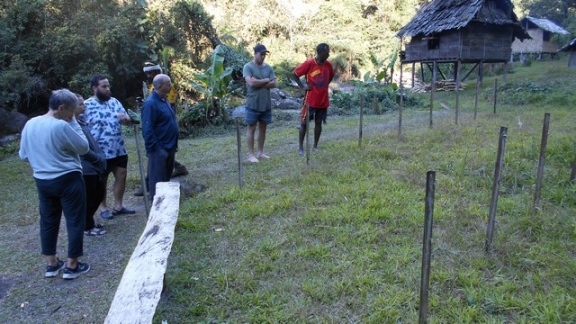 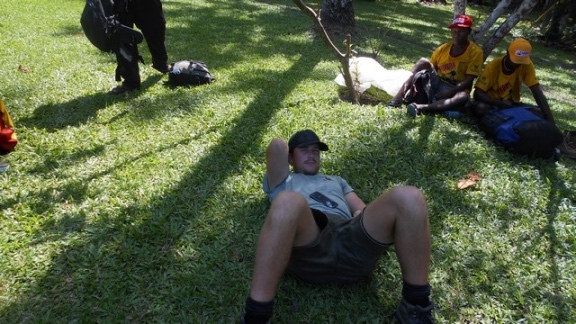 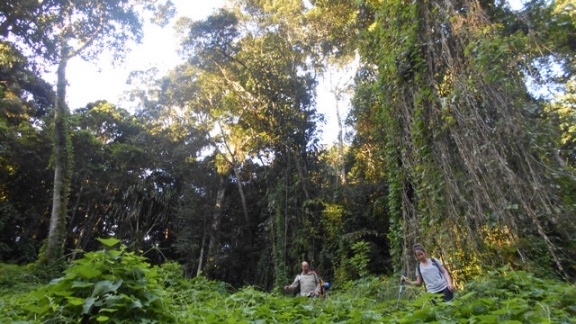 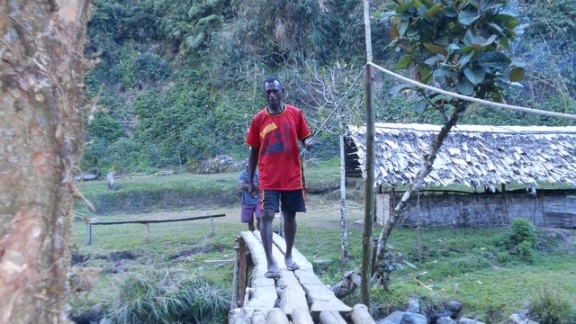 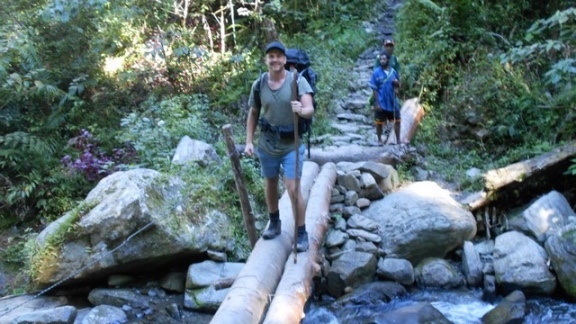 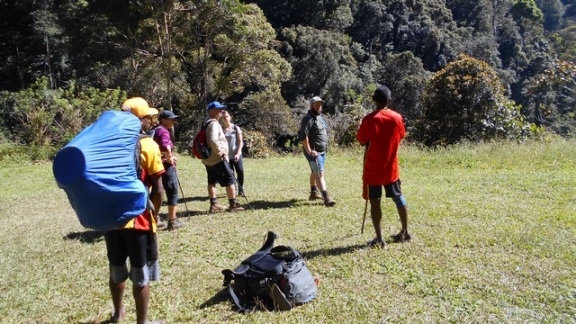 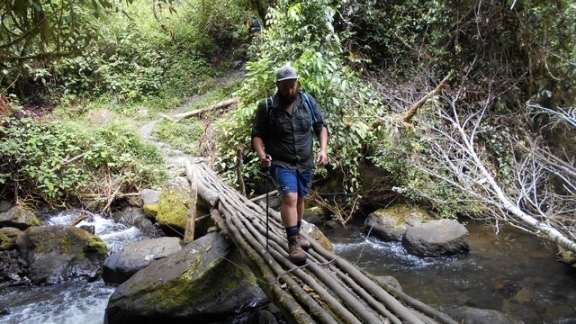 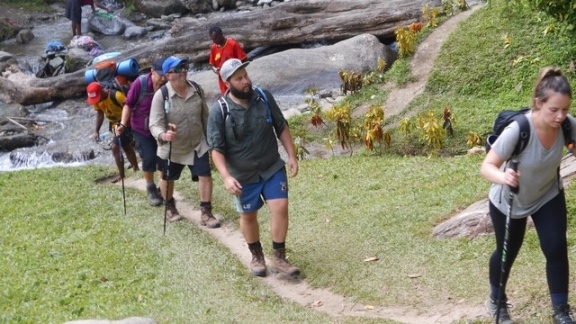 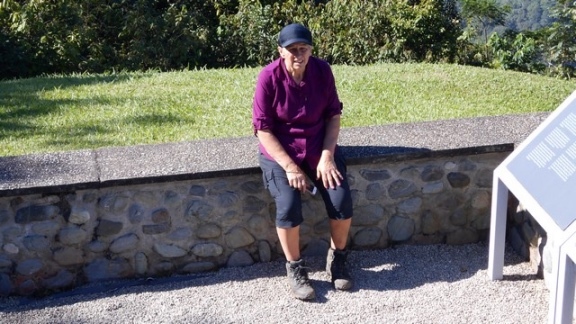 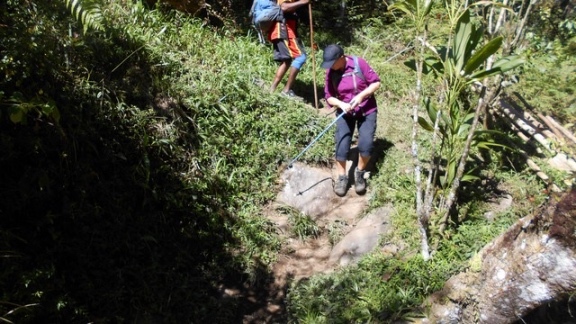 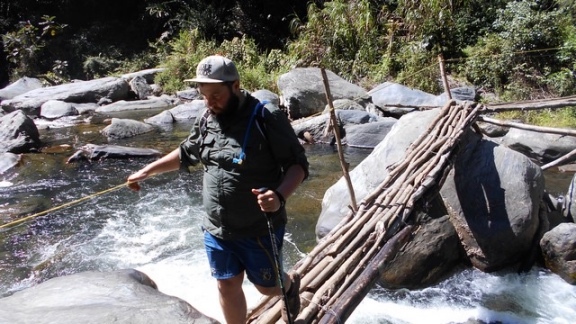 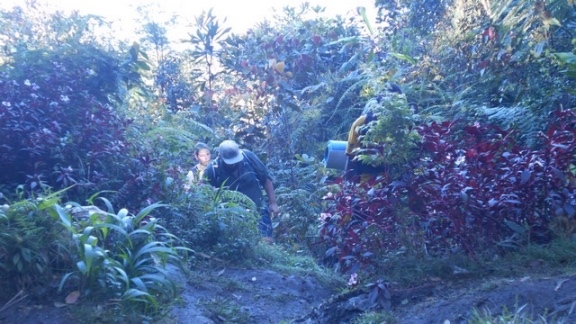 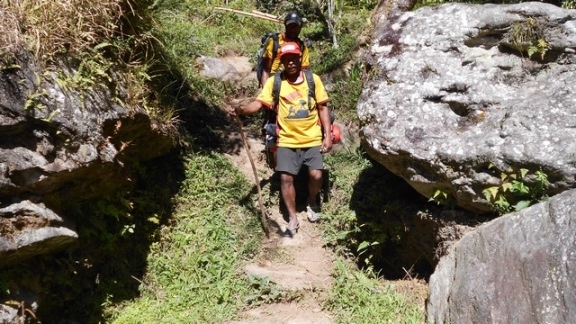 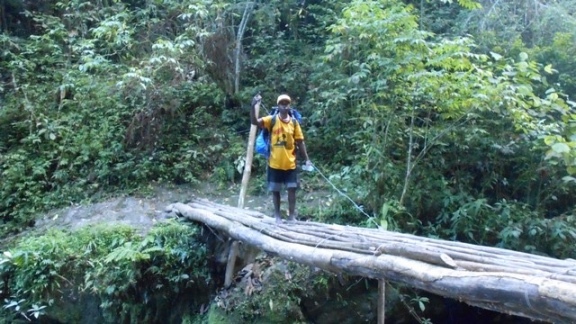 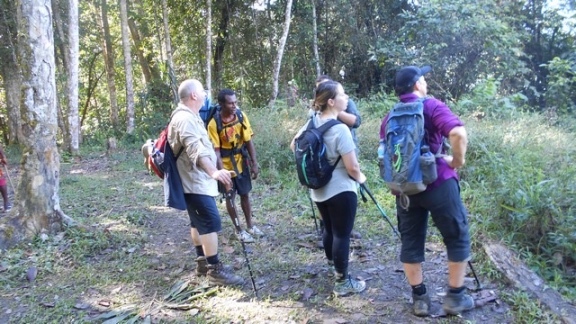 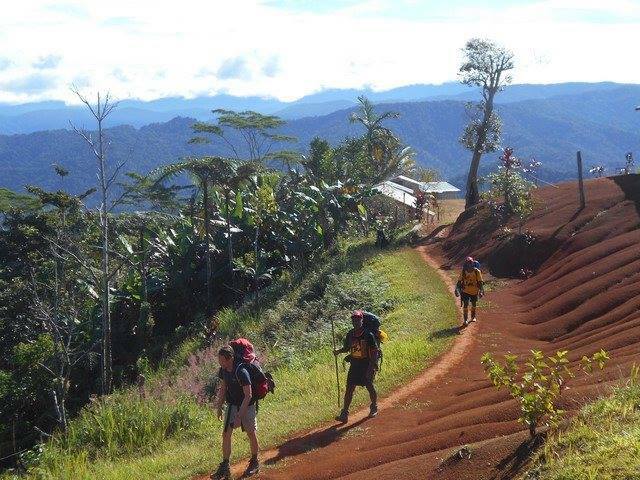 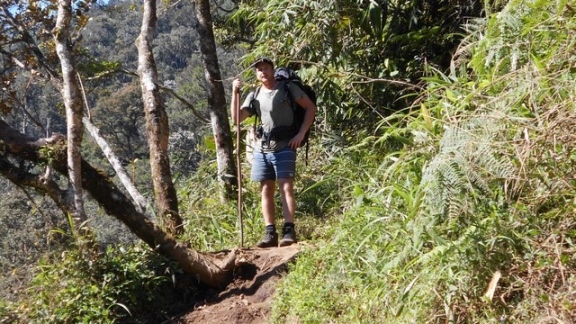 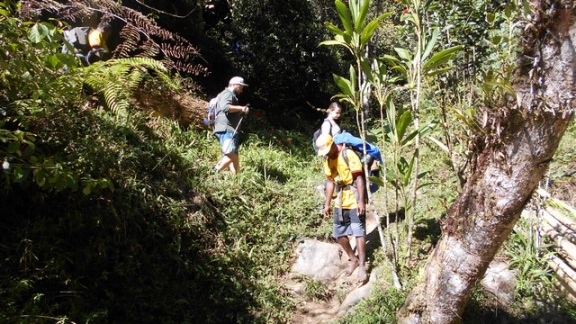 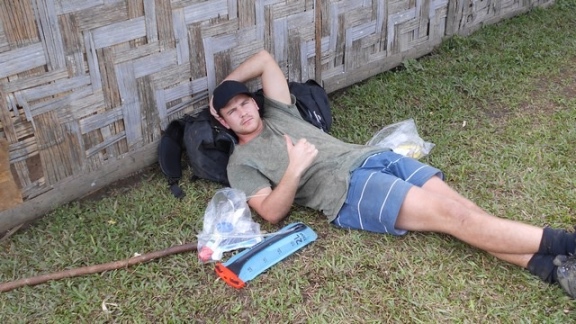 A big thank you to our Kokoda Trekking staff, Harold Hauro and his team of porters. 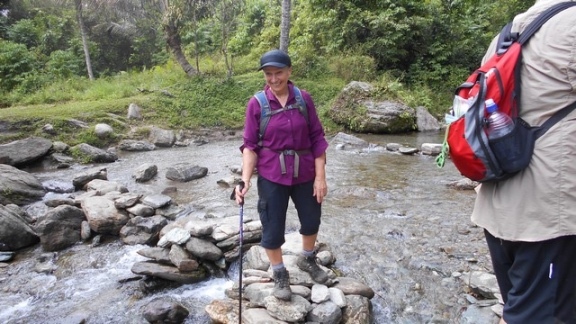 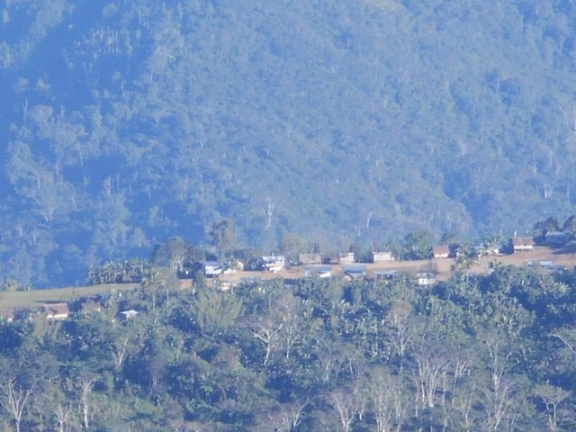 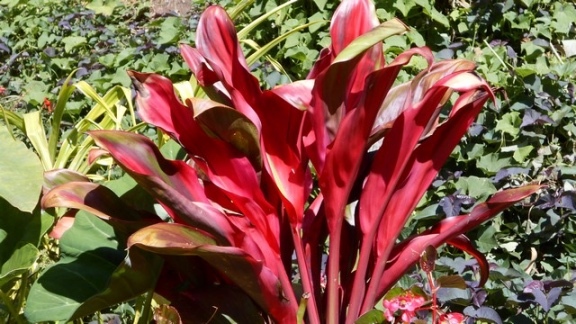 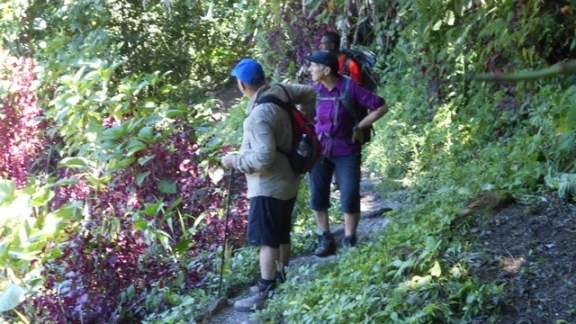 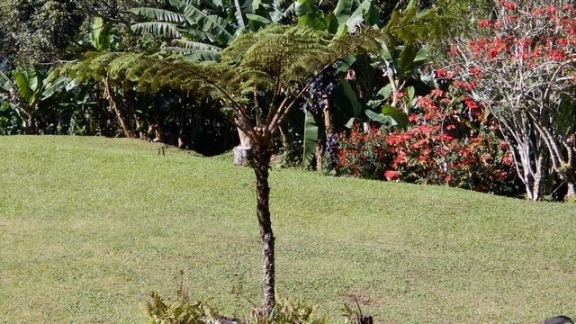 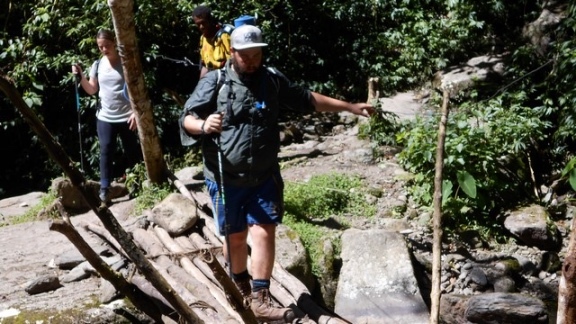 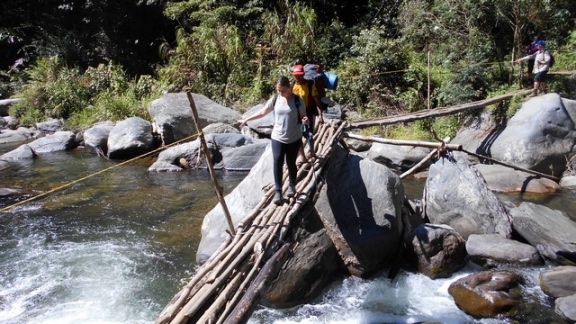 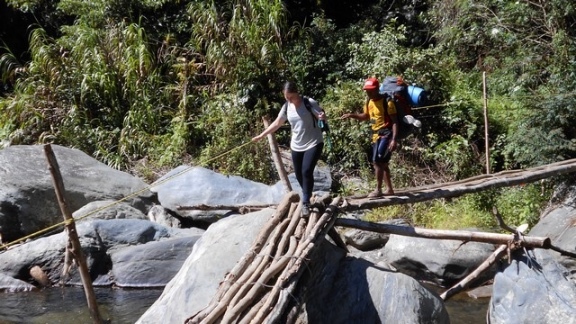 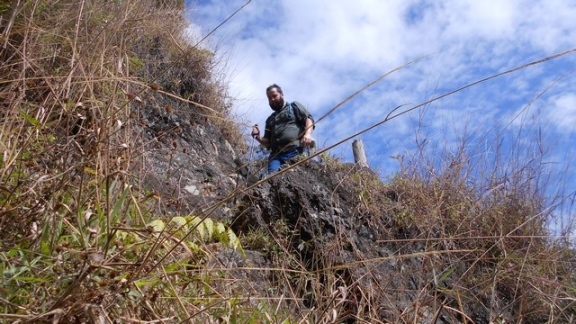 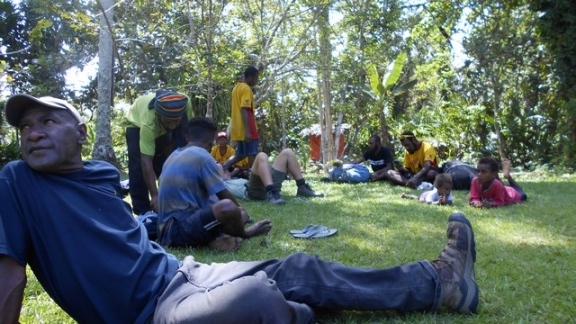 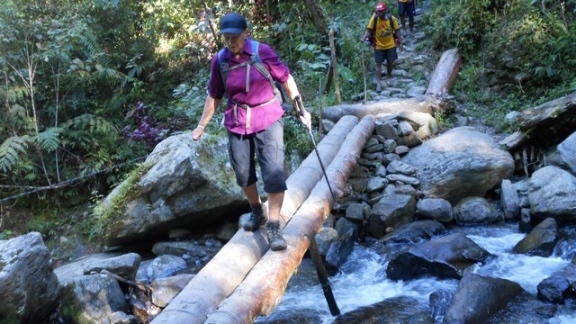 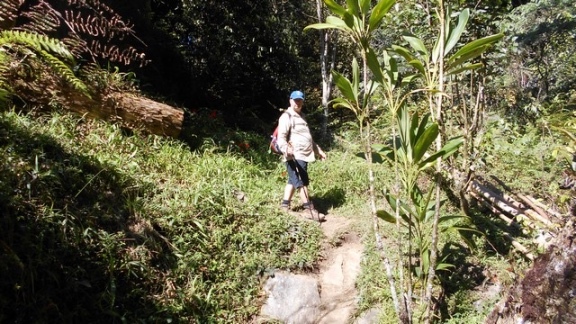 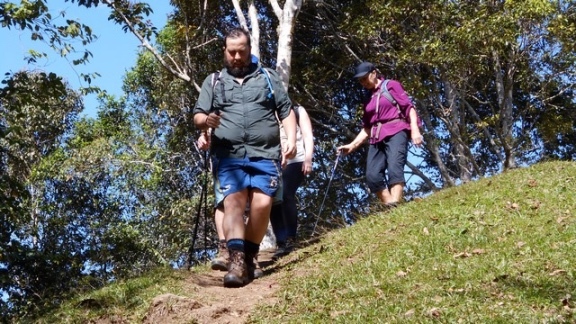 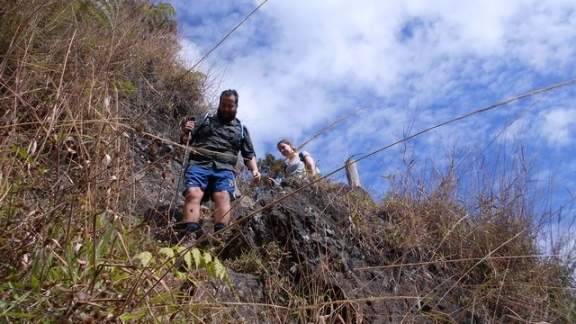 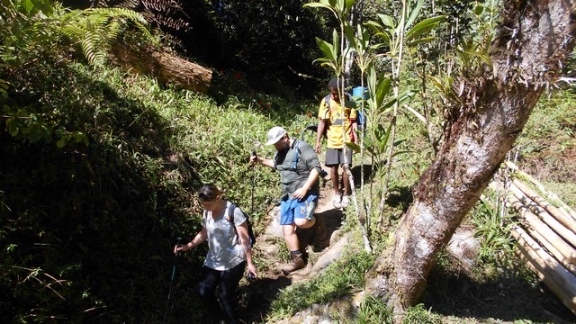 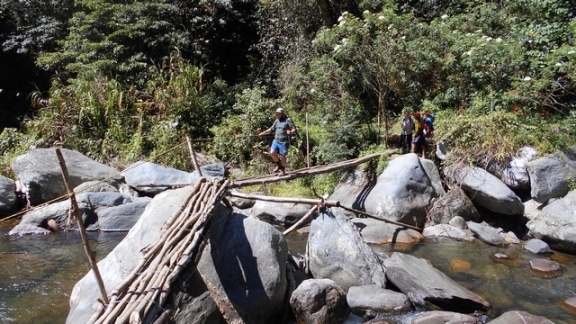 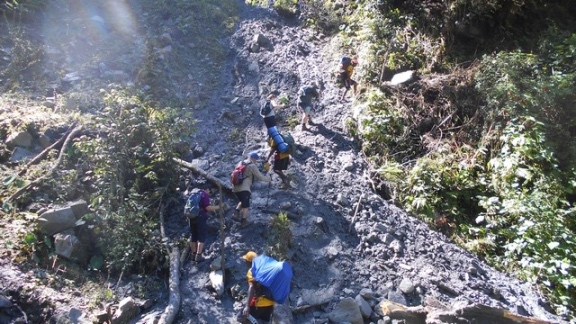 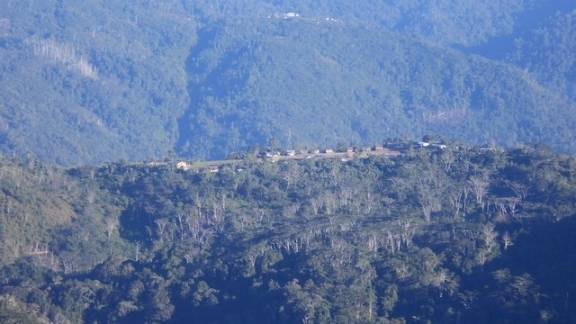 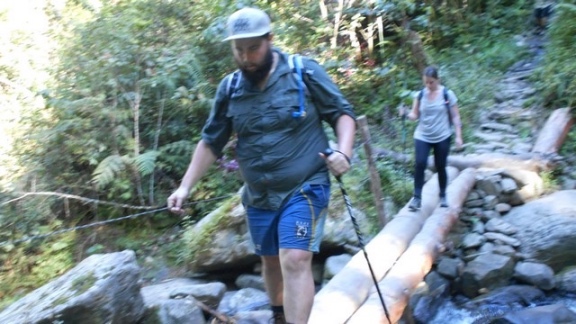 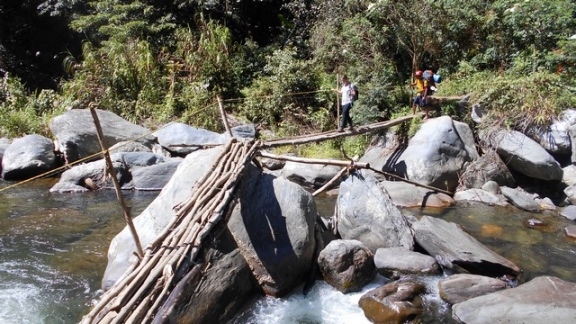 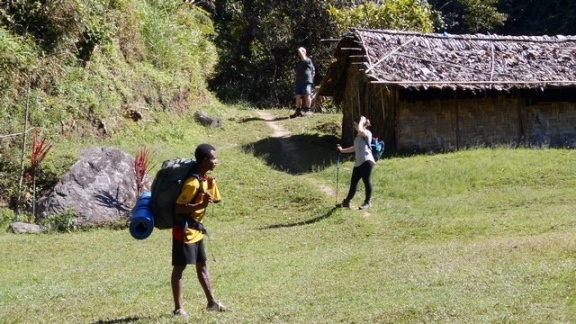 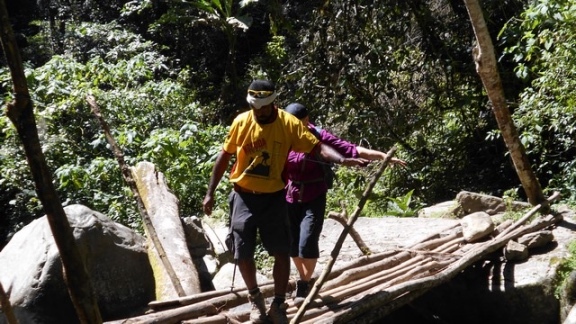 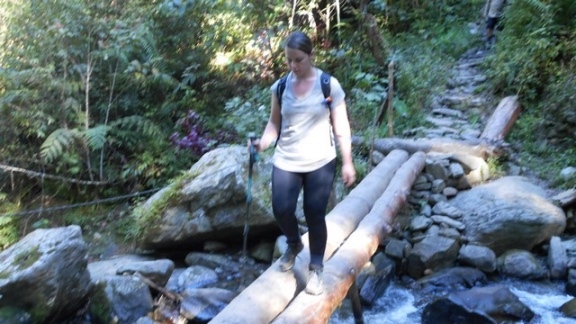 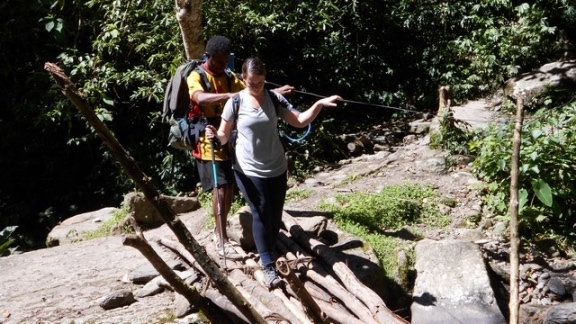 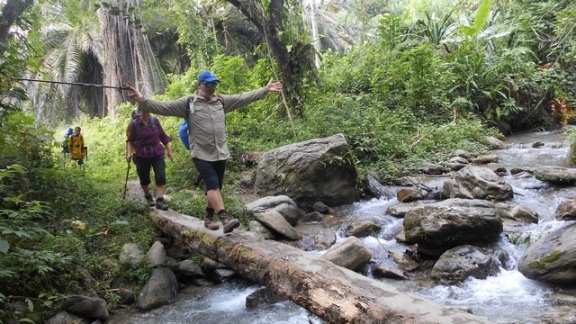 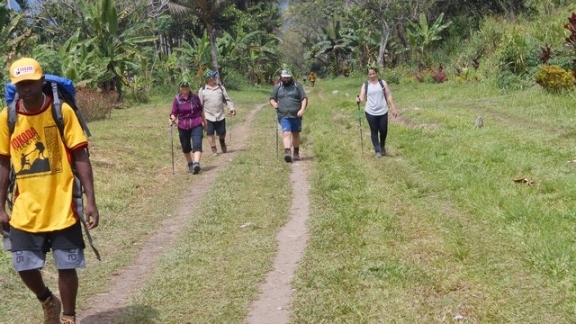 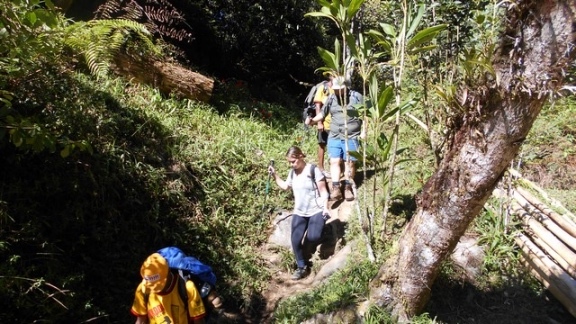 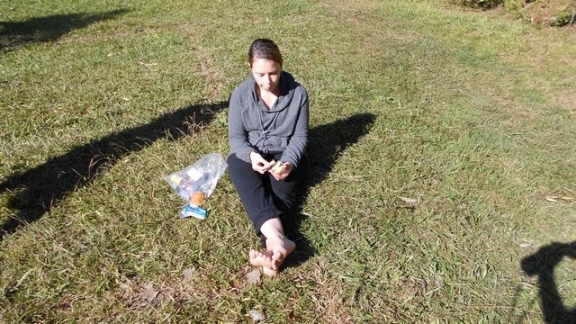 Trekkers will be flown back to Port Moresby tomorrow morning.